FRANCE - North Coast - Buoyage. Fl.Y.2·5s at 51° 05´·90N., 2° 09´·53E. Fl.Y.2·5s at 51° 04´·45N., 2° 11´·15E. UKHO Charts: 323, 1350, 1872 and 1873. UKHO Leisure Folios: 5605.2, 5605.10. Deletion of two Yellow special buoys on the banks off Dunkerque-Ouest. ENGLISH CHANNEL - Radio reporting lines. Legends. UKHO Charts: 323, 536, 1406, 1610, 1872, 1873, 2449, 2450, 2451, 2656, 2675, and 1607. This Notice deals with the radio reporting lines for Dover and also another zone beyond where I monitor. The list of UKHO charts has very slightly adjusted lat/long so if noting UKHO charts, please refer to the full NtM on the button to the left. I regret most to the ‘reporting lines’ are out of the monitored area and therefore I cannot include a useful image. NETHERLANDS - Wind farm. Restricted areas. 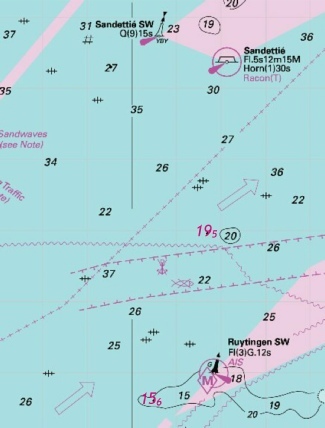 Note: This update is included in New Edition 1630, published 6 December 2018.
symbol, wind farm 51°35´·80N., 2°58´·52E. UKHO Charts: 110 and 1630. An emendation to the border of the Rentel Wind Farm. The impact is that the east border has extended very slightly. Frankly little difference to see! symbol, wind turbine, Mo(D)Y.16s Horn Mo(U)30s at 51°37´·09N., 2°57´·31E. The previous Notice and this notice both talk about the Rentel Wind Farm but is described ‘Netherlands – Wind Farm’ in the first and ‘Belgium-Wind turbines’ in the second. But it has some logic: the eastern border of the wind farm abuts to Dutch waters. 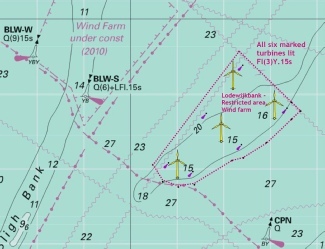 This Notice repeats part of Notice 5513(P) in the previous week citing Turbines G1, G5 and A4 for the large scale chart. The image would be exactly the same as in the previous week. BELGIUM - Measuring instrument. Buoy. A measuring instrument marked by a yellow buoy has been established in position 51° 15´·17N., 2° 51´·51E. But for the want of a figure this could have been a palindromic latitude . Special buoy very close to the Buitenstroombank north cardinal off Oostende..
BELGIUM - Wind farm. Restricted area. Wind turbines. Turbine R A1 Mo(D)Y.16s & Horn Mo(U)30s at 51° 35´·45N., 2° 53´·44E. Turbine R G1 Mo(D)Y.16s & Horn Mo(U)30s at 51° 37´·09N., 2° 57´·31E. Turbine R G8 Mo(D)Y.16s & Horn Mo(U)30s at 51° 35´·49N., 3° 00´·06E. Turbine R A7 Mo(D)Y.16s & Horn Mo(U)30s at 51° 33´·84N., 2° 56´·31E. Turbine R D1 Fl.Y.4s at 51° 36´·19N., 2° 55´·49E. Turbine R G5 Fl.Y.4s at 51° 36´·19N., 2° 58´·89E. Turbine R D6 Fl.Y.4s at 51° 34´·82N., 2° 57´·88E. Turbine R A4 Fl.Y.4s at 51° 34´·62N., 2° 54´·81E. These changes will be included in a New Edition of Chart 1630 to be published 6 December 2018 and a New Edition of Charts 1872 and 1874 to be published early 2019. Chart 110 will be updated by Notice to Mariners. Former Notice 1938(P)/17 is cancelled. UKHO Charts: 110, 1630, 1872 and 1874. 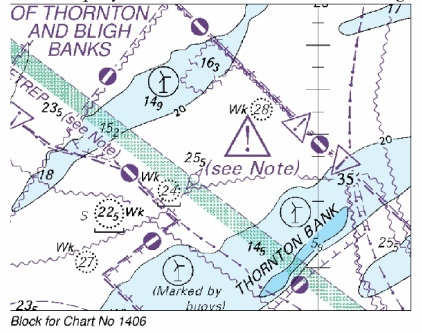 This notice showing the limits of the Rental Wind Farm which is between the Northwind and Thorntonbank Wind Farms. Being in Belgium waters, the area is prohibited to be entered. The notice also shows the SPS (Significant Peripheral Structure) and IPS (Intermediate Peripheral Structures) turbines (i.e. the turbines marked by light). Other turbines are not included. Note: Charts 1406 and 2449 are to be deleted from the list of charts affected by Notice 1938(P)/17. the accompanying block, centred on: 51° 35´·5N., 2° 56´·1E. the accompanying block, centred on: 51° 35´·6N., 2° 56´·9E. UKHO Charts: 1406 and 2449. This has two blocks for the two listed charts but covering the same area. This brings up to date the Preliminary Notice introduced in week 34 of 2017 vide NoM 1938(P)/17. 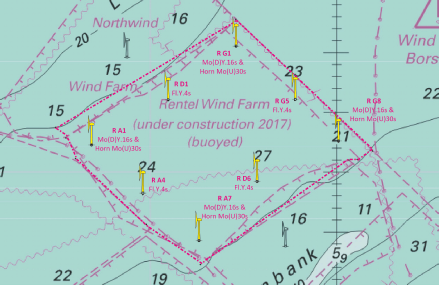 This Notice recorded 6 new cardinal and special buoys marking the Rentel Wind Farm between the Thortonbank Windfarm and the Lodewijkbank Wind Farm. That area is prohibited to us. The Blocks do not include the buoyage at that scale but my 2017 list can provide an image in Week 34 of the buoyage. depth, 4.9 at 51° 27´·31N., 2° 30´·95E. Delete 5.7.
depth, 4.9, at 51° 26´·99N., 2° 30´·41E. Delete depth, 5.8, close NE. depth, 5.3 at 51° 26´·45N., 2° 29´·69E. Delete depth, 5.9, close SW.
depth, 5.8 at 51° 25´·78N., 2° 28´·91E. depth, 6.4 at 51° 24´·58N., 2° 27´·71E. Delete depth, 7.1, close SW.
legend, Works in progress (2018), centred on: 51° 09´·16N., 2° 43´·58E. depth, 6.4, with depth, 5.9 at 51° 25´·29N., 2° 28´·36E. depth, 8.9, with depth, 7.8 at 51° 23´·87N., 2° 26´·96E. depth, 6.4, with depth, 5.5 at 51° 28´·63N., 2° 32´·88E. UKHO Charts: 323, 1406, 1630, 1872 and 1873. 9 reduced depths on the Westhinder but all over 4 metres. The image includes one reduced depth vide NtM 1893 from week 17 to complete the area. 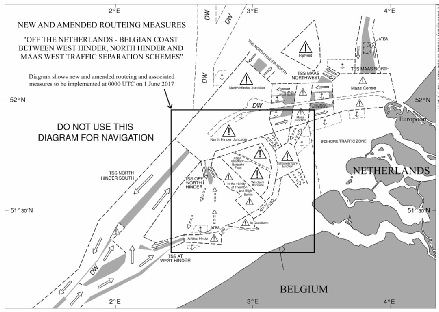 The current new notice also includes a warning of ‘Works in Progress’ in the Nieuwpoort Harbour. depth, 6.3 at 51°42´·52N., 3°28´·46E. Delete depth, 7.1, close S in Chart 110, delete depth 6.3, close NW in chart 1406 and delete depth, 7.4, close SW in Chart 1630. UKHO Charts: 110, 1406 and 1630. A single reduction of depth adjacent to the west of the north part of the Steenbanken channel. 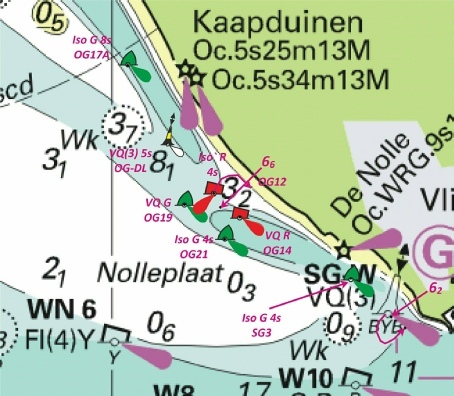 Five new FOULs, four in and around the Steendiep channel and Steenbanken and the fifth further north on the Schouwenbank. BELGIUM - NM Blocks. Legends. Note: Former Notice 4836(T)/17 is cancelled. Insert the accompanying block, centred on: 51° 20´·6N., 3° 13´·0E. the accompanying block, centred on: 51° 20´·6N., 3° 13´·0E. 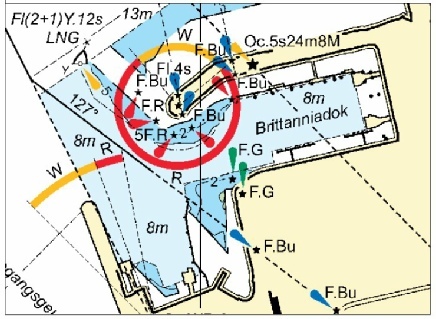 A UKHO block for part of Zeebrugge Harbour and three new ‘Historic Wk’ annotations. NETHERLANDS - Platform. Restricted area. Fog signal. New platform in the Wind Farm Borssele Passage on route to the Westerschedt. Fl(4)Y.20s DY4 at 51°06´·88N., 2°23´·11E. 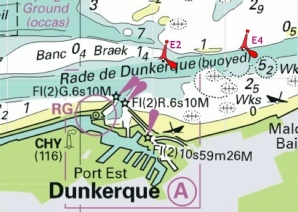 Yellow Special Buoy DY4 at the edge of the Banc Breedt off Dunkerque has been deleted! the accompanying block, centred on: 51°48´·1N., 3°48´·1E. A UKHO block covering the Nature Reserve area just off the Westhoofd coast. depth, 3.5 at 51° 40´·54N., 3° 25´·06E. A new reduced depth just on the northern side of the Steenbaken, one of the banks off shore the Oosterschedt. NORTH SEA - Netherlands Sector - Buoyage. North Cardinal BB-North VQ at 51° 43´·65N., 2° 57´·93E. South Cardinal BB-South Q(6)+LFl.15s at 51° 43´·54N., 2° 57´·93E. Mariners are advised to navigate with caution in the area. Two temporary cardinal buoys ‘en route’ between the North Hinder system and towards the Westerschelde..
FRANCE - North Coast - Depths. depth, 10.2 at 51° 01´·58N., 1° 50´·77E. Delete depth, 12.9, close SE. UKHO Charts: 323, 1610, 1892 and 2449. A reduction on the north-eastern edge of the Ridens de Calais but still at over 10m this will not hinder leisure craft. NM1 51° 19´·76N., 3° 07´·57E. NM2 51° 19´·75N., 3° 05´·76E. Two temporary south cardinal buoys just off and east of Blankenberge. Could be related to the installation of the UK/Belgium power cable..
ENGLAND - South East Coast - Obstruction. 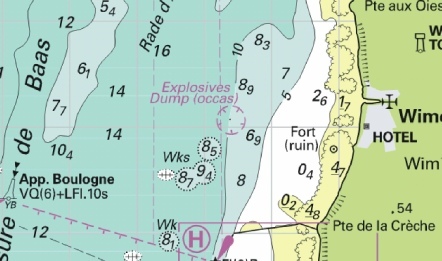 Unexploded Ordnance Rep (2018) at 51° 19´·31N., 1° 56´·12E. UKHO Charts: 323, 1406, 1610 and 2449. 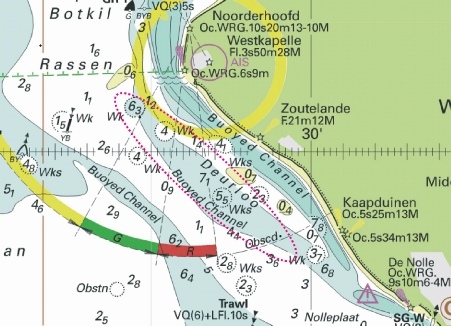 Unexploded ordnance found in the Sandiettie DW channel but at 25m or more, not likely to hinder leisure craft. NETHERLANDS - Breskens - Buoyage. VH 2, with, Iso.R.2s VH 2 at 51°24´·34N., 3°33´·90E. Re-designation of light characteristics at a port hand buoy off Breskens. This is an identical NtoM (No 2858, last week) but for a different UKHO chart..
FRANCE - North Coast - Dunkerque - Lights. All 4 lights marking the Yacht Club Mer du Nord Marina are deleted! BELGIUM - Westhinder - Foul. at 51° 24´·23N., 2° 36´·35E. UKHO Charts: 1872 and 1873. A new FOUL in the Westhinder shipping anchorage. In over 20m so unlikely to hinder leisure craft. NORTH SEA - Netherlands Sector - Steenbanken and North Hinder Junction - Buoy. Obstruction. Wrecks. or according to chart, with (a) at 51° 39´·13N., 3° 19´·92E. Obstn at 51° 51´·34N., 2° 37´·88E. UKHO Charts: 110, 1406, 1630 and 2449. Removal of a cardinal buoy (and increase of depth) marked a wreck in the Middlediep channel off the Dutch coast. Removal of an obstruction in the Bollen Van Goeree channel. BELGIUM - Wielingen - Obstruction. Buoy. 1. An obstruction, dangerous to surface navigation, exists in position 51° 19´·91N., 3° 08´·39E. 2. A north cardinal light-buoy, Q NM, has been established in position 51° 20´·07N., 3° 07´·99E. UKHO Charts: 1872, 1874 and 2449. New dangerous obstruction west of Zeebrugge, close to the shore. 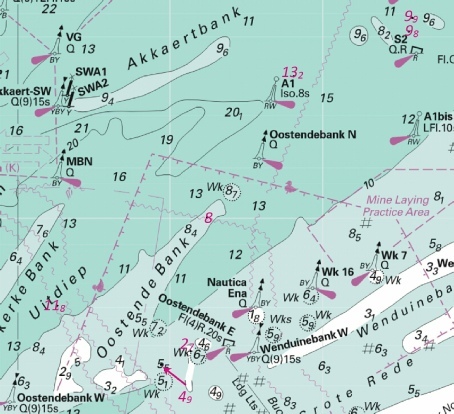 NORTH SEA - Netherlands Sector - Buitenbanken and Approaches to Scheveningen - Buoyage. LFl.G.5s MW 3 with LFl.G.8s MW 5 at 51° 54´·10N., 3° 24´·29E. Fl.G.8s, MW 5 with Fl.G.5s, MW 7 at 51° 56´·26N., 3° 35´·66E. UKHO Charts: 122, 130 and 1630. 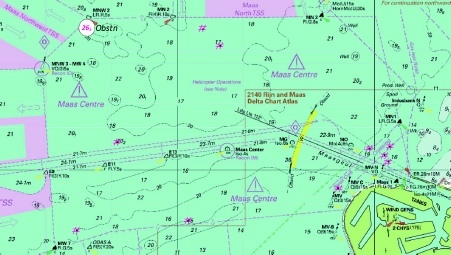 Re-designation and change of light characteristics for two of the Maas Channel lateral buoys. NETHERLANDS - Deurloo and Rede Van Vlissingen - Drying height. Depths. depth, 10.1 at 51° 26´·04N., 3° 33´·83E. depth, 0.5, with drying height, 0 5, enclosed by enclosed by 0m low water line at 51° 29´·88N., 3° 26´·90E. Delete depth, 0.7, close SW.
One reduced depth off Vlissingen and one drying height on the Deurloo off the Walcheren coast. I regret I cannot produce an image because of a software problem on my system. BELGIUM - Vlakte van de Raan - Depth. depth, 5.3 at 51° 26´·14N., 3° 08´·21E. A reduction of depth close to the S8 buoy north of Zeebrugge. Unlikely to hinder leisure craft. BELGIUM - Zeebrugge - NM Blocks. Insert the accompanying block, centred on: 51° 20´·9N., 3° 12´·8E. FRANCE - North Coast - Banc In Ratel S - NM Block. Depths. depth, 2.2, enclosed by 5m contour 51°06´·76N., 2°16´·98E. depth, 4, enclosed by 5m contour 51°06´·46N., 2°16´·50E. depth, 4.3, enclosed by 5m contour 51°06´·18N., 2°16´·43E. Insert the accompanying block, centred on: 51°06´·2N., 2°16´·6E. Three reductions of depth in a small unmarked channel between the offshore sandbanks off Dunkerque. Not a likely place we would be! Note the first image shows the reduced depths, the second a larger scale of the channel via the UKHO block for Chart 1350 (Both images available from the usual button opposite). BELGIUM - Broers Bank - Buoyage. Mo(U)Y.15s CB11 (3 buoys) at 51°07´·09N., 2°34´·46E. designation of light-buoy to, CB16 51°06´·92N., 2°34´·65E. designation of light-buoy to, CB17 51°06´·95N., 2°34´·80E. 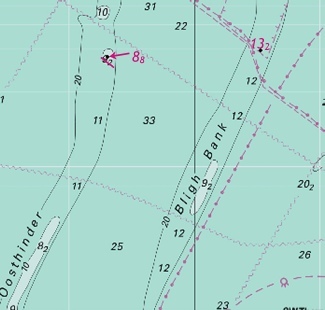 Three new yellow special marks on the Broers Bank (adjacent to the Trapegeer channel) and two existing buoys re-designated. BELGIUM - Oostende - Buoy. 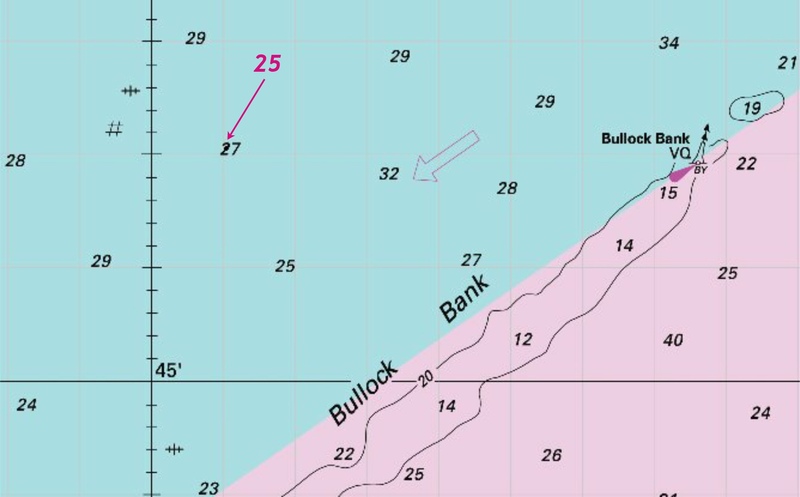 A yellow spherical wave recorder buoy, aKust5, has been established in position, 51°14´·43N., 2°55´·24E. BELGIUM - Oosthinder - Depths. depth, 8.1 at 51° 33´·12N., 2° 39´·09E. Delete depth, 8.8, close NE. depth, 9.4, and extend 10m contour N to enclose at 51° 24´·78N., 2° 32´·78E. depth, 19.5, enclosed by 20m contour at 51° 21´·07N., 2° 40´·94E. depth, 19.7, enclosed by 20m contour at 51° 21´·01N., 2° 40´·25E. Delete depth, 21.5, close SE and depth, 20.9, close W.
depth, 12.8, with depth, 11.3 at 51° 30´·43N., 2° 37´·68E. depth, 11.1, with depth, 10.1 at 51° 36´·16N., 2° 41´·20E. Six reduced depths on the Oosthinder and environs. All depths still over 9+M at least unlikely to hinder leisure craft. BELGIUM - Thornton Bank to Westpit - Works. Wind farm. Restricted area. Buoyage. Works are in progress to establish the Norther Windfarm between Thornton Bank and Westpit. North Cardinal NRT-N Q 51° 34´·65N., 3° 01´·75E. Special NRT1 Fl.Y.5s 51° 33´·59N., 3° 03´·56E. East Cardinal NRT-E Q(3)10s 51° 32´·62N., 3° 05´·25E. Special NRT2 Fl.Y.5s 51° 31´·60N., 3° 04´·30E. Special NRT3 Fl.Y.5s 51° 29´·92N., 3° 00´·81E. Special NRT4 Fl.Y.5s 51° 29´·48N., 2° 59´·49E. South Cardinal NRT-S Q(6)+LFl.15s 51° 28´·91N., 2° 57´·89E. Special NRT5 Fl.Y.5s 51° 29´·77N., 2° 56´·48E. 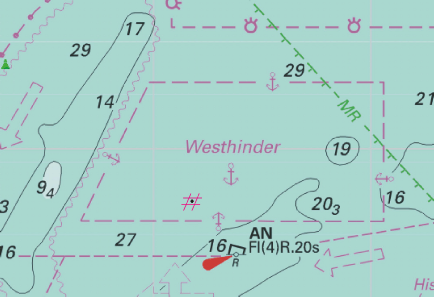 West Cardinal NRT-W Q(9)15s 51° 30´·69N., 2° 55´·30E. Unauthorised vessels are not permitted to enter the construction area. Mariners are advised to navigate clear of the limits of the construction area. Charts will be updated when works are complete. New windfarm starting construction in Belgium waters just south of the existing Thorntonbank windfarm. 100% exclusion zone! BELGIUM - Oostende - Light. Deletion of the former harbour entrance light. FRANCE - North Coast - Dunkerque N - Wrecks. at 51° 07´·94N., 2° 15´·66E. 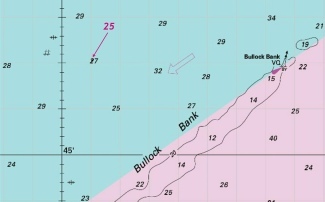 Change in wreck depth in the offshore banks off Dunkerque. ENGLAND - South East Coast - Approaches to Ramsgate - Submarine power cable. Previously notified in temporary notice 713(P) this year. BELGIUM - Oostende N and Wielingen - Buoyage. Fl.Y.5s HD3 at 51° 14´·78N., 2° 55´·59E. Fl.Y.5s HD5 at 51° 21´·18N., 3° 07´·25E. Fl(5)Y.20s aKust23 at 51° 21´·58N., 3° 07´·19E. Fl.Y.5s HD6 at 51° 23´·49N., 3° 11´·95E. One new special buoy just east of the Oostende Harbour and three new special buoys off Zeebrugge..
FRANCE - North Coast - The Ridge (Le Colbart) NE - Wreck. Wk at 50° 56´·38N., 1° 23´·82E. A ‘new’ wreck on the edge of the TSS central ‘reservation just south of the Cobart N north cardinal buoy. Unusually this is ‘an unsurveyed wreck over which the exact depth is unknown but which is considered to have a safe clearance at the depth shown’. At 32m, this will not hinder leisure craft. A north cardinal light-buoy, Q DM1, has been temporarily established in position 51° 13´·82N., 2° 52´·91E. New north cardinal buoy established over wrecks west of the Oostende harbour. 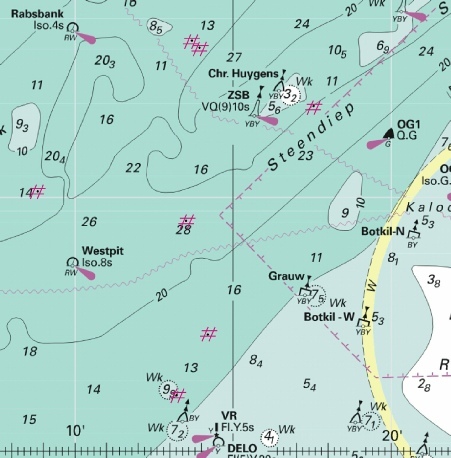 NETHERLANDS - Approaches to Westerschelde - Geul van de Rassen - Depths. depth, 0.8 at 51° 31´·97N., 3° 24´·45E. Delete depth 1.6, close SE. A ‘nasty’ reduction of depth in the Geul van de Rassen in the second of two offshore passages down to Vlissengen. BELGIUM - Blankenberge - Note. Note: Former Notice 450(T)/18 is cancelled. Insert the accompanying note, DEPTHS AND BUOYAGE, centred on: 51° 16´·16N., 3° 06´·54E. This refers to (and deletes) the Temporary Notice 450(T) of Week 4 this year but I would suggest that the image of that NtM is still relevant. ENGLISH CHANNEL - Dover Strait - Submarine cable. Charts will be updated when the works are complete. Route of the submarine cable. BELGIUM - Blankenberge - Depths. Buoyage. 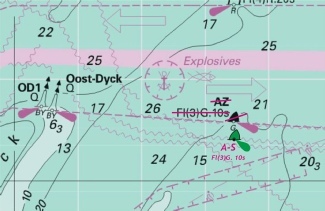 *Lit or unlit buoys may exist to mark the shoaling. *Mariners are advised to navigate with caution in the area and to consult the local port authority for the latest information. Former Notice 5135(T)/17 is cancelled. *Indicates new or revised entry. 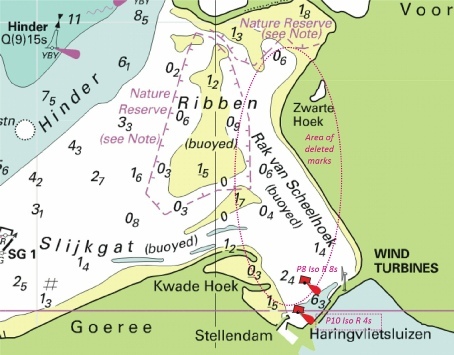 Continued warnings of shoaling in the centre of the harbour entrance of Blankenberg. Currently I cannot find any further local information other than Belgium Notices reporting that Buoys BL1, BL2, BL3, BL5 have been removed. That buoyage was temporarily placed at the entrance during the season last year. depth, 2.7 at 51° 25´·95N., 3° 26´·40E. Delete depth, 3.5, close NW, depth, 4, close SE and depth, 3.5, close W.
UKHO Charts: 116, 1872, and 1874. One reduction of depth on the Sluissche Hompels bank which is north of the Scheur channel to Vlissingen. FRANCE - North Coast - Calais - Depth. Dredged areas. 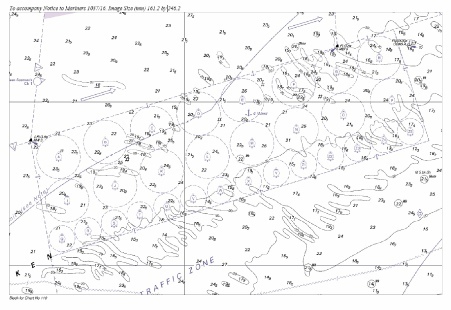 a) A 12·5m dredged area, centred on position 50° 58´·228N., 1° 51´·826E., is now dredged to 11·5m. b) An 8·0m dredged area exists, centred on position 50° 58´·182N., 1° 51´·346E. 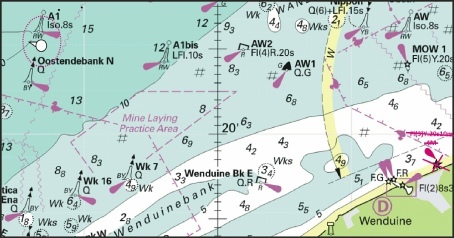 c) An 8·0m dredged area exists at Berth 9, centred on position 50° 58´·082N., 1° 51´·589E. 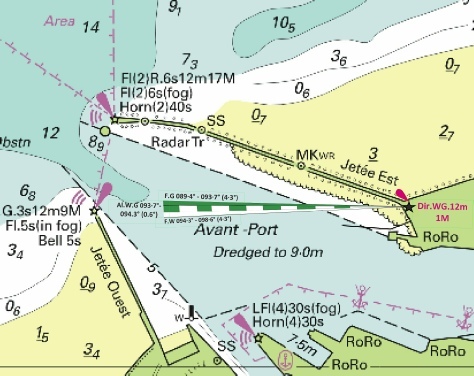 d) An extended 6·5m dredged area exists at Berth 6, centred on position 50° 58´·080N., 1° 50´·890E. 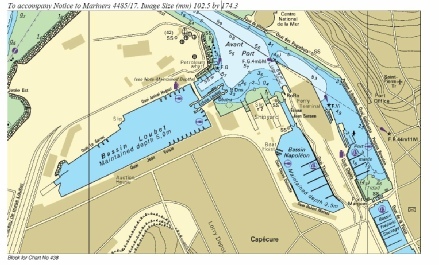 e) Dredging to a depth of 7·2m has been carried out in the Arrière-Port, centred on position 50° 57´·878N., 1° 50´·995E. 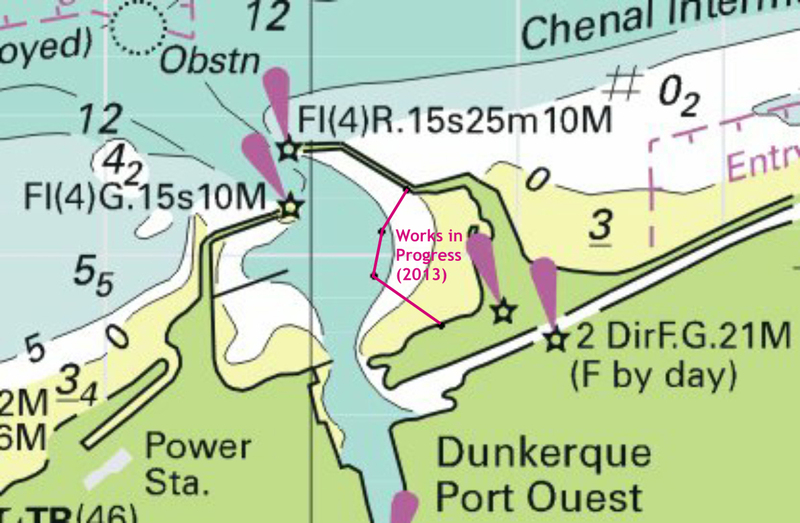 f) A 9·5m dredged area, centred on position 50° 57´·838N., 1° 51´·170E., at Quai Paul Devot, is now dredged to 8·5m. 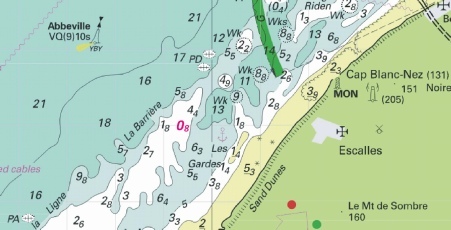 g) The Bassin Carnot, centred on position 50° 57´·658N., 1° 51´·609E., has a depth of 5·8m. These changes will be included in a New Edition of Chart 1351 to be published in January 2018 and in a New Edition of Chart 8164 to be published mid 2018. 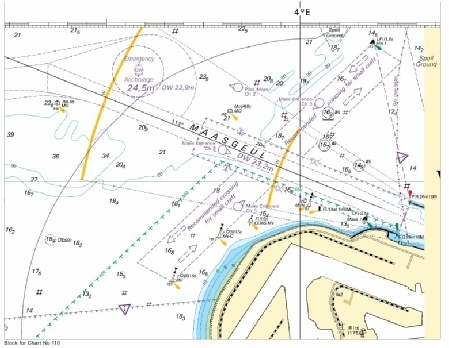 Revised depths with the commercial side of Calais Harbour. All unlikely to hinder leisure craft. 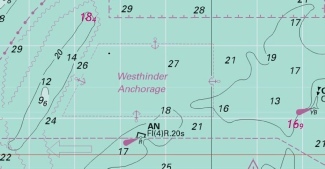 Chart 323 - International Chart Series, Dover Strait, Eastern Part. Note: This chart remains affected by Notices 956(T)/16, 490(T)/17 and 5072(T)/17. Note: This chart is to be deleted from the list of charts affected by Notice 3496(P)/17. This chart remains affected by Notices 490(T)/17, 4087(P)/17 and 5072(T)/17. Includes changes to depths, wrecks, obstructions, windfarms and territorial sea limits. BELGIUM - Wenduinebank S - Fouls. at 51° 17´·39N., 2° 58´·47E. and 51° 17´·32N., 2° 56´·47E. 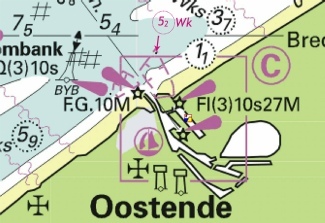 A new defined area of FOUL east of Oostende and deletion of two adjacent Fouls close by. NETHERLANDS - Schouwen W - NM Block. Depths. the accompanying block, centred on: 51° 44´·2N., 3° 37´·2E. depth, 2.9 at 51° 35´·25N., 3° 30´·61E. Delete depth, 3.8, close NE and depth, 4, close W.
depth, 10.4 , with depth, 9.8, enclosed by 10m contour at 51° 50´·36N., 3° 46´·05E. There are three distinct areas of change. FRANCE - North Coast - Haut Fond de Gravelines W - Buoyage. Automatic Identification System. Note: This update is included in New Editions 323 and 1610, published 23 November 2017. VQ(9)10s H.F.Gravelines at 51° 04´·10N., 2° 05´·10E. and Automatic Identification System, AIS. Delete former H.F.Gravelines light-buoy, close SW. Addition of AIS on the H.F.Gravelines west cardinal buoy offshore. The black dot on the image indicates the very slight movement of the position of the buoy. BELGIUM - Broers Bank SW - Buoyage. Restricted area. Mo(U)Y.15s CB19 at 51° 06´·95N., 2° 34´·80E. Mo(U)Y.15s CB20 at 51° 06´·92N., 2° 34´·65E. Small restriction and marked prohibited area off the De Panne Beaches (the Dunkirk beaches). BELGIUM - Oostende - Legend. legend, Radar Tr Surveillance Station, centred on: 51° 14´·250N., 2° 55´·660E. Deletion of the legend regarding the Radar Surveillance Station at the entrance of the inner jetties of Oostende. NETHERLANDS - Schouwenbank Junction - Pilot boarding place. 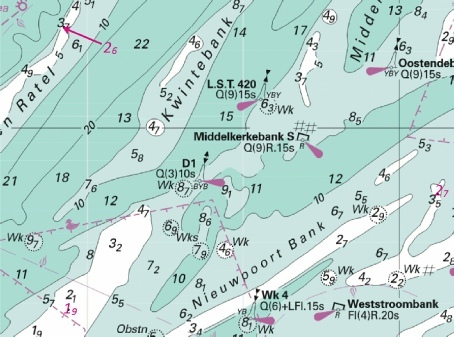 Steenbank, from: 51° 44´·60N., 3° 15´·36E. to: 51° 44´·96N., 3° 14´·32E. 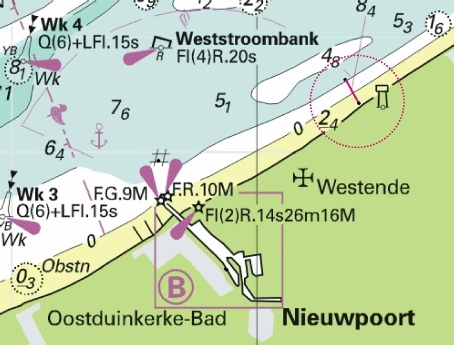 The Pilot boarding place has been moved to the Schouwenbank safe water buoy. BELGIUM - Zeebrugge to Thorntonbank NW - Submarine power cable. Anchoring and fishing is prohibited within the vicinity of these positions. New submarine power cable out from Zeebrugge to the Thorntonbank Wind Farm. Now please note of the NtM in Week 4 of 2018. The 4 lateral buoys now deleted but shoaling still occurring. Starboard-hand BL1 Fl(2)G.5s 51° 18´·93N., 3° 06´·48E. Starboard-hand BL3 Fl(2)G.5s 51° 18´·92N., 3° 06´·44E. Starboard-hand BL5 Fl(2)G.5s 51° 18´·92N., 3° 06´·41E. Port-hand BL2 Fl(2)R.5s 51° 18´·93N., 3° 06´·54E. Former Notice 4796(T)/15 is cancelled. 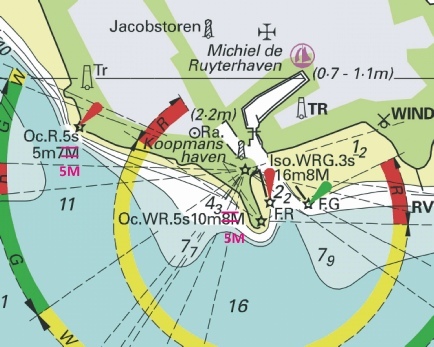 A revision of the temporary buoyage at the entrance to the Blankenberge harbour and marina. The buoy moorings extend 150m to the north-east and south-west. UKHO Leisure Folios: 5605.10, 5606.1. New special buoy for data collection in the Binnen Ratel channel north of Dunkerque. AIS equipped. BELGIUM - Zeebrugge and Blankenberge - Buoy. Fog signal. Fl.Y.5s HBL at 51° 19´·03N., 3° 06´·09E. fog signal, Horn(3+1)90s, and associated symbol, fog signal, at light 51° 20´·86N., 3° 12´·18E. Deletion of a special yellow buoy off Blankenberg and deletion of the fog signal on the Port Control in Zeebrugge harbour. There is no image available of the charted yellow special buoys. 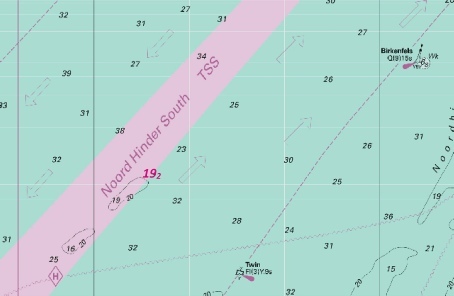 BELGIUM - TSS Off North Hinder - Virtual aids to navigation. 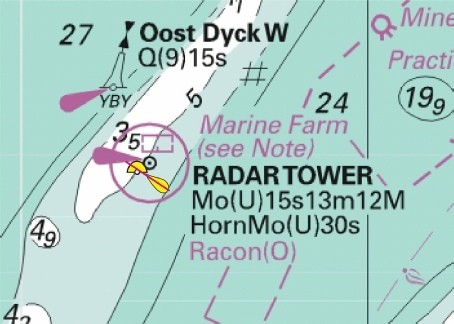 symbol, Virtual aid to navigation, triangular topmark, V-AIS OHR 3 with, symbol, Virtual aid to navigation, cross topmark, V-AIS OHR 3 at 51° 39´·07N., 2° 44´·34E. symbol, Virtual aid to navigation, triangular topmark, V-AISOHR 5 with, symbol, Virtual aid to navigation, cross topmark, at V-AIS OHR 5 at 51° 42´·25N., 2° 41´·40E. 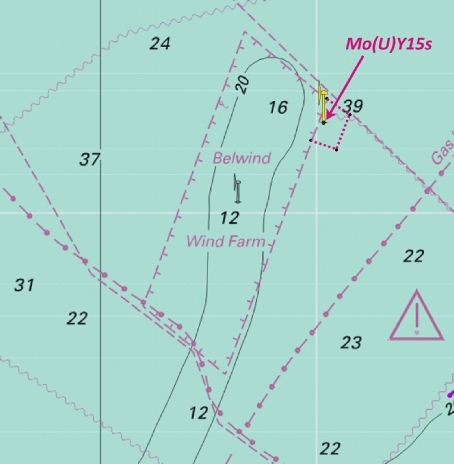 Change of virtual topmarks on two Virtual AIS marks to the west of the Belwind Wind Farm. FRANCE - North Coast - Boulogne-sur-Mer - NM Block. Note. the accompanying block, centred on: 50° 43´·5N., 1° 35´·4E. 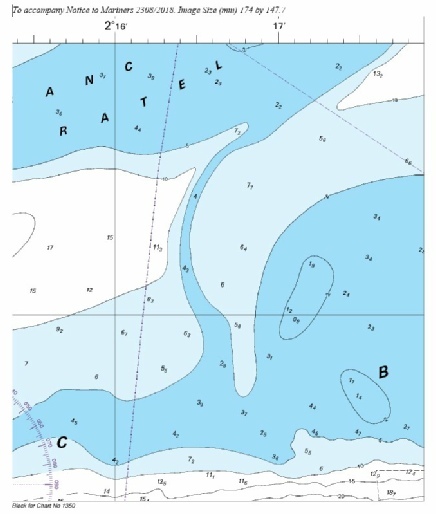 note, BASINS, centred on: 50° 41´·924N., 1° 36´·224E. NETHERLANDS - Approaches to Westerschelde - Galgeput - Depths. depth, 5.9 at 51° 27´·29N., 3° 31´·60E. Delete depth, 6.6, close NE. 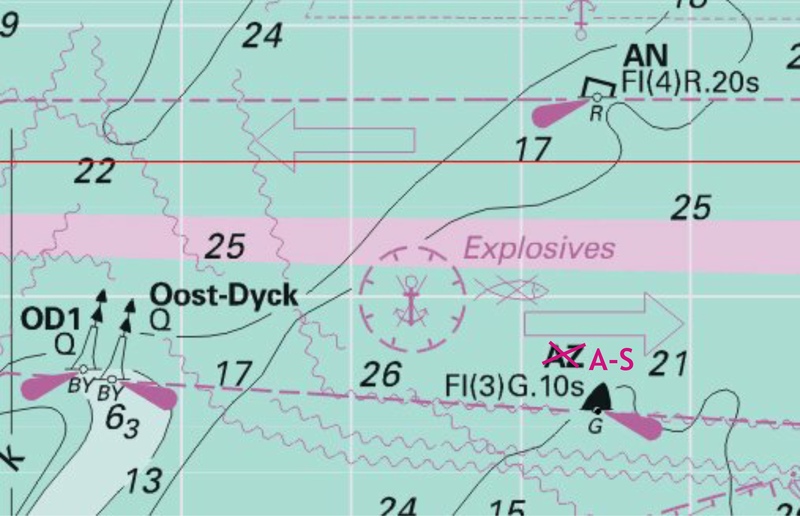 An extensive list of buoys were reported in the Galgeput channel in the approaches to the Westerschelde in NtM 2660 in week23. The single reduction of depth are at the same position as the buoy marked OG22. ENGLAND - South East Coast - Fairy Bank NW - Wreck. at 51° 34´·65N., 2° 02´·23E. A new wreck on the NW of the Fairy Bank which lies SE of the end of the North Falls tail and before the SW bound TSS land. At 47m, unlikely to hinder leisure craft. 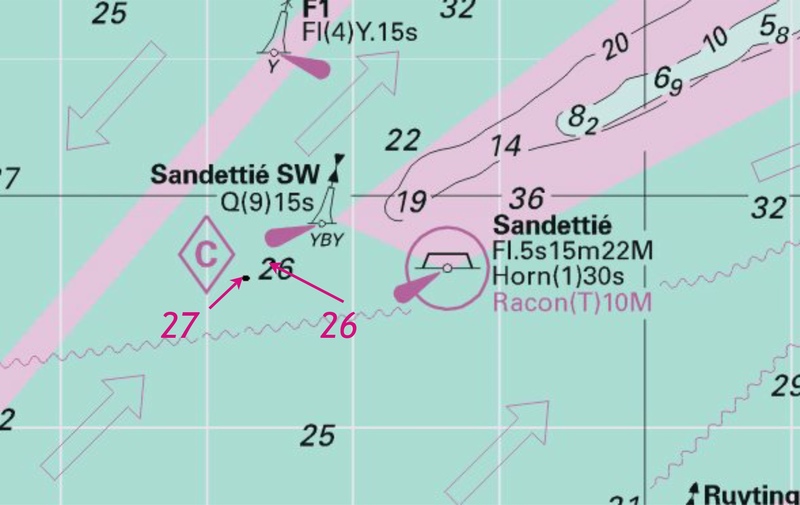 FRANCE - North Coast - Banc In Ratel NE - Automatic Identification System. Automatic Identification System, AIS, at light-buoy 51° 09´·45N., 2° 19´·42E. 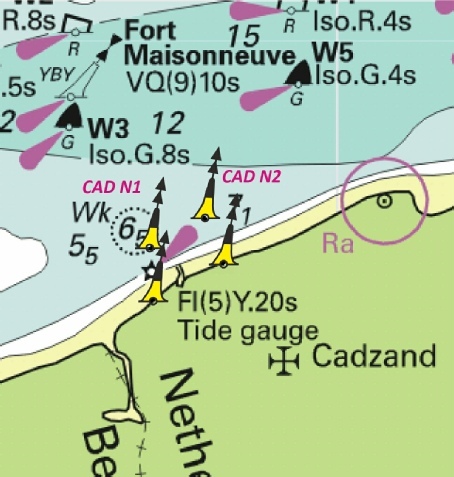 Addition of AIS on the DY2 south cardinal buoy marking the Dyck channel offshore north of Dunkerque. BELGIUM - Nieuwpoort Bank S, Grote Rede and Negenvaam N - Buoyage. Wreck. Q(6)+LFl.15s V@S-S at 51°10´·85N., 2°39´·73E. Fl.Y.5s V@S2 at 51°11´·12N., 2°39´·99E. light-buoy to, Fl.Y.5s at 51°20´·95N., 2°42´·44E. A series of new buoys gathering (presumably) the existing wreck off Nieupoort and a new wreck with over 7m almost due north of Ostende. BELGIUM - Vaargeul 1 - Buoyage. Fl(2)R.10s VG6, from: 51° 25´·05N., 2° 57´·93E. to: 51° 25´·22N., 2° 56´·24E. Fl.G.5s VG5, from: 51° 24´·65N., 2° 57´·92E. to: 51° 24´·73N., 2° 56´·78E. FRANCE - North Coast - Calais N - Buoyage. Restricted area. This NtM was first notified as a Temporary NtM in week 52 of 2015. This is now ‘upgraded’ as a permanent NtM. 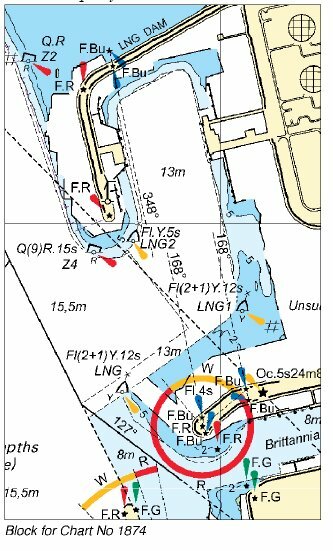 Note the area is restricted and that means holding to the east of the harbour entrance waiting for permission to enter Calais is forbidden. NETHERLANDS - Wielingen - Cadzand-Bad NW - Buoy. Mo(A)8s CZ at 51° 23´·08N., 3° 23´·07E. New Safe Water buoy off the entrance to Cadzand-Bad. NORTH SEA - United Kingdom Sector - Bruine Bank (Brown Ridge) W, TSS North Hinder North W and Goote Bank SE - Buoyage. Legends. NM Blocks. Notes. the existing note, HISTORIC WRECKS, with the accompanying note, HISTORIC AND MILITARY WRECKS, centred on: 50° 53´·39N., 3° 51´·45E. the accompanying block, centred on: 51° 28´·5N., 3° 46´·2E. Fl(2)R.10s VG 6, from: 51° 25´·07N., 2° 57´·91E. to: 51° 25´·22N., 2° 56´·24E. Fl.G.5s VG 5, from: 51° 24´·63N., 2° 57´·92E. to: 51° 24´·73N., 2° 56´·78E. Insert the accompanying block, centred on: 52° 53´·9N., 4° 49´·0E. This NtM deals with a collection of additions of legends of Military Wrecks which are out of the area I monitor. 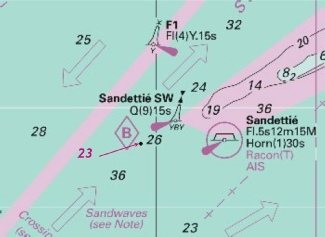 However it includes a move of two lateral DW channel buoys in the outer approaches to Zeebrugge. The two moves are illustrated but as the ‘legends’ are all in deep water and further north of the monitored area I have NOT included an image. The full NtM is, however, downloadable. FRANCE - North Coast - Binnen Ratel - Depths. depth, 7.6 at 51° 11´·22N., 2° 22´·79E. Delete depth, 8.3, close SE. depth, 3.4, with depth, 2.7 at 51° 09´·52N., 2° 24´·33E. 5 reduced depths over the Binnen Ratel sand (that is north of Dunkerque Port Est. The depths for leisure craft are probably not critical in reasonable conditions. BELGIUM - Blankenberge - Buoyage. Shoaling exists at the entrance to Blankenberge. BL1 Fl(2)G.5s at 51° 18´·928N., 3° 06´·372E. BL3 Q.G at 51° 18´·932N., 3° 06´·403E. BL5 Fl(2)G.5s at 51° 18´·938N., 3° 06´·435E. BL7 Q.G at 51° 18´·942N., 3° 06´·469E. BL9 Q.G at 1° 18´·941N., 3° 06´·501E. A temporary NtM adding new buoyage off the entrance to Blankenberge – the entrance looks badly shoaled. I have tried to find more information via marina website but none at the moment. At http://www.scarphout.be/algemene-info.html there is a useful video which has a distant view towards the end that looks like the relative position some of the buoyage. I think it likely to be dredged. FRANCE - North Coast - Out Ruytingen E - Depths. depth, 4.2, enclosed by 5m contour 51° 09´·72N., 2° 08´·63E. depth, 9.9, enclosed by 10m contour 51° 09´·86N., 2° 11´·05E. Delete depth, 11.2, close E.
A reduction to two depths either side of the Passe de Ruytingen. BELGIUM - Blighbank - Buoy. Restricted area. NM Blocks. the accompanying block, centred on: 51° 37´·4N., 2° 45´·4E. the accompanying block, centred on: 51° 39´·7N., 2° 51´·3E. the accompanying block, centred on: 51° 37´·0N., 2° 44´·3E. Iso.8s SW Thornton at 51° 30´·95N., 2° 50´·92E. Iso 8s SW Thornton at 51° 30´·95N., 2° 50´·92E. the accompanying block, centred on: 51° 38´·7N., 2° 45´·8E. Iso.8s SW Thornton at 51° 30´·98N., 2° 50´·92E. 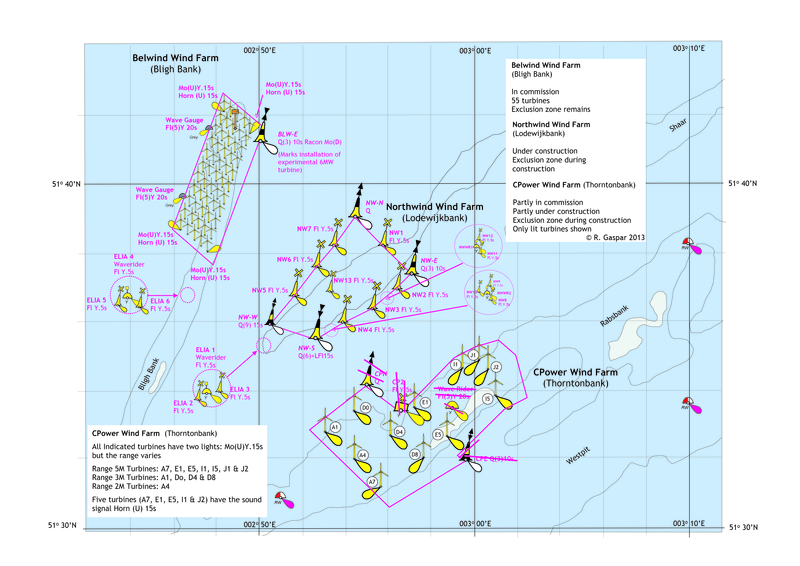 Small amendment of the designation of the Belwind Wind Farm: four chart blocks, one each for the designated charts, except for chart 1874 which is for manuscript amendment. Note the SW Thornton Safe Water buoy south of the amendment is now deleted. BELGIUM - Zeebrugge - Pontoon. A new pontoon inside the Albert II dok in Zeebrugge harbour. FRANCE - North Coast - Rade d.Ambleteuse - Restricted areas. circular limit of restricted area, Explosives Dumping Ground (occas), radius 200m, centred on: 50° 46´·065N., 1° 34´·392E. former circular limit of restricted area, Explosives Dumping Ground (occas), radius 180m, centred on: 50° 46´·047N., 1° 34´·420E. This notice very slightly moves the centre of the restricted area. 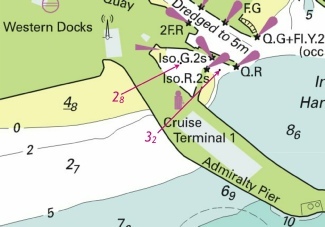 The image below shows the existing old restricted area and compares the centre of the new area with the black spot marking its centre – probably not noticeable for leisure craft. NETHERLANDS - Slijkgat - NM Block. Buoyage. the accompanying block, centred on: 51°50´·9N., 4°00´·4E. P 2A at 51°51´·52N., 4°00´·74E. P 1A at 51°51´·38N., 4°00´·72E. Iso.R.8s P 4A at 51°51´·26N., 4°01´·69E. The UKHO block is for Chart 110; the three new marks are included in that block but separately listed for Chart 112. The block is comprehensive. BELGIUM - Wielingen S - Buoy. Fl.Y.5s HD4 at 51°21´·75N., 3°17´·50E. 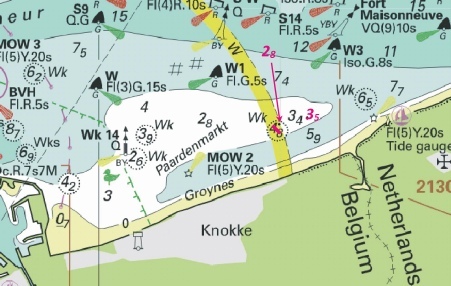 New yellow special mark very adjacent to the existing light MOW2, east of the Zeebrugge harbour. NETHERLANDS - Buitenbanken W and Eurogeul - Note. Buoyage. Legends. Recommended direction of traffic flow. NM Block. Insert the accompanying block, centred on: 51°56´·1N., 3°46´·2E. Amend designation of buoy to, MW 1-SNW 4 at 51°50´·10N., 3°03´·46E. 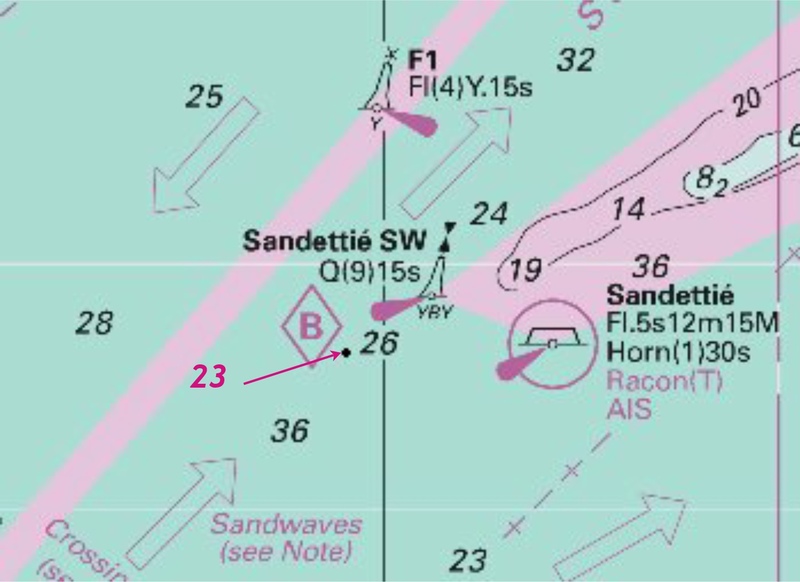 designation of buoy to, SNW 2 at 51°46´·32N., 3°09´·80E. Insert the accompanying block, centred on: 51°56´·2N., 3°45´·4E. legend, Two-way Route Schouwenbank NE, centred on: 51°52´·26N., 3°19´·70E. recommended direction of traffic flow arrow, direction 25°, centred on: (a) 51°52´·50N., 3°21´·20E. These changes are associated with the implementation of the ‘New and Amended Routeing measures of Off the Netherlands – Belgium Coast between West Hinder, North Hinder and Maas West Traffic Separation Schemes’. 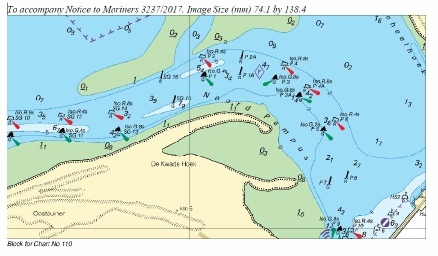 There are two blocks for the designated charts 110 and 122 and these affect the shipping anchorage east of the Goeree. The blocks can be downloaded opposite. 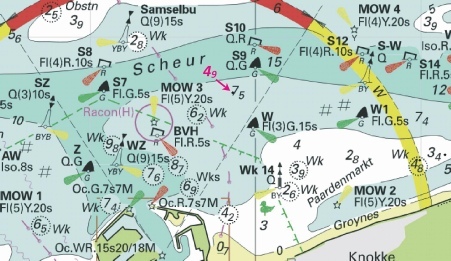 The changes of the buoyage designation affects new buoyage for the new ‘Two-way Route Schouwenbank NE’. I regret I have incomplete details to attempt to illustrate these changes. The outline image used earlier this year can be used to compare the changes against old charts. FRANCE - North Coast - Dunkerque N - Buoy. New yellow special buoy in one of the offshore channel north of Dunkerque. BELGIUM - Westhinder SW - Depth. Note: Former Notice 1385(P)/17 is cancelled. depth, 16.3 at 51° 21´·55N., 2° 24´·39E. Small reduction of depth in the West Hinder TSS but well safe for leisure craft. FRANCE - North Coast - Dunkerque Port-Ouest - Lights. light to, Dir Fl.4s15m20M 51° 01´·67N., 2° 11´·92E. light to, Dir Fl.4s29m20M 51° 01´·51N., 2° 12´·37E. Change of light characteristics on the two lights marking the link canal in the Commercial Port. 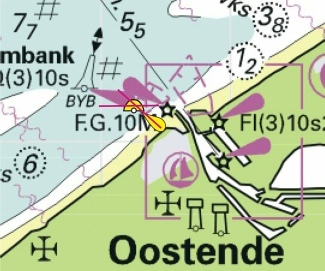 NETHERLANDS - Approaches to Westerschelde - Cadzand-Bad - Buoyage. CZ 2 at 51° 22´·94N., 3° 23´·04E. former CZ 2, with CZ 4 at (a) 51° 22´·87N., 3° 22´·98E. 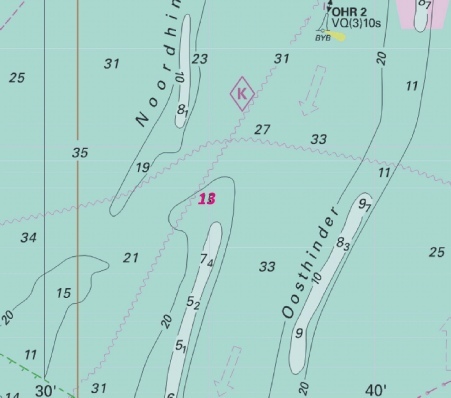 Two new marks close inshore of the Netherland’s coast near Cadzand. NETHERLANDS - Schouwenbank NE - Buoy. VQ(9)10s Bollen at 51° 49´·70N., 3° 32´·65E. 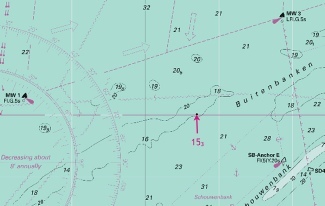 A simple delete of the west cardinal buoy ‘Bollen’ north-east of the Schouwenbank on route to the Hook of Holland. 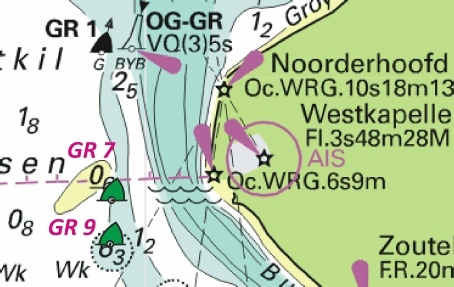 NETHERLANDS - Approaches to Westerschelde - Buoyage. at 51° 37´·08N., 3° 23´·88E. Iso.R.4s OG 4 at 51° 35´·91N., 3° 24´·19E. Q.R OG 6 at 51° 33´·79N., 3° 25´·70E. OG 8 at 51° 31´·26N., 3° 26´·04E. OG 10 at 51° 30´·47N., 3° 27´·42E. OG 12 at 51° 30´·00N., 3° 28´·44E. OG 14 at 51° 29´·48N., 3° 29´·50E. OG 19 at 51° 28´·50N., 3° 30´·22E. OG 16 at 51° 28´·52N., 3° 30´·59E. OG 18 at 51° 27´·88N., 3° 31´·20E. OG 20 at 51° 27´·43N., 3° 31´·43E. OG 21 at 51° 27´·50N., 3° 30´·74E. OG 22 at 51° 27´·27N., 3° 31´·66E. OG 23 at 51° 27´·05N., 3° 31´·53E. OG 24 at 51° 27´·13N., 3° 32´·36E. Q(9)15s OG-DR, from: 51° 34´·42N., 3° 25´·14E. to: 51° 34´·51N., 3° 25´·02E. Iso.G.8s OG 5, from:51° 33´·95N., 3° 23´·92E. to: 51° 34´·10N., 3° 23´·88E. Iso.4s OG at 51° 33´·57N., 3° 25´·10E. 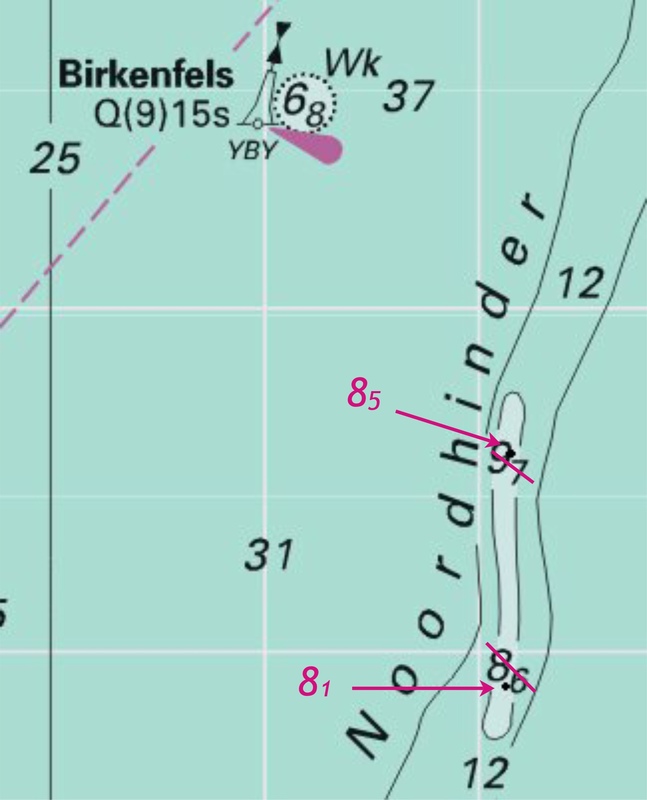 Some deletions, some moves but the majority just re-designation of buoy numbers in the buoyed inshore channel from Vlissingen northwards. NORTH SEA - Netherlands Sector - Bol van Knokke - Obstruction. Explosives have been reported lost in position 51° 25´·16N., 3° 19´·35E. 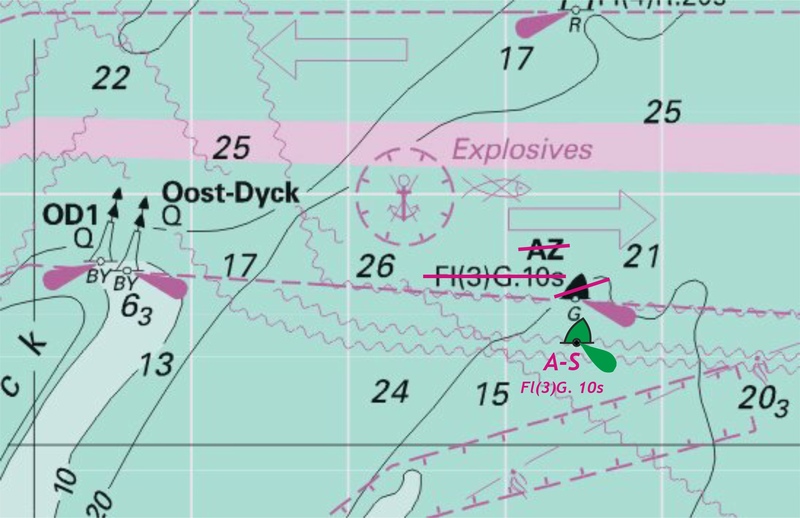 The position of the lost explosives is shown by the magenta waypoint symbol. 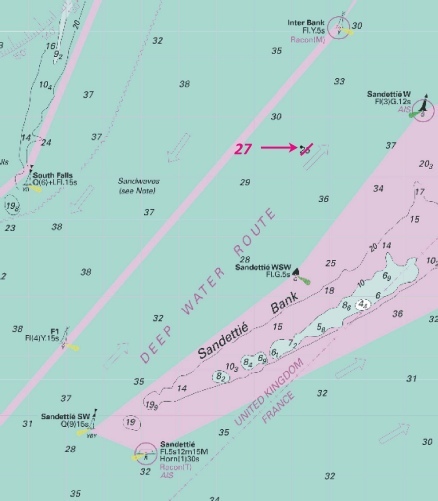 DOVER STRAIT - Sandettié Bank - Depths. depth, 6.1, and extend 10m contour SW to enclose 51° 11´·03N., 1° 50´·55E. Delete depth, 8.4, close NE and depth, 6.9, close SW.
depth, 4.4, and extend 5m contour W to enclose 51° 11´·80N., 1° 52´·86E. Delete depth, 5, close E.
Two reductions of depth on the Sandiettie. The shallowest part is getting more shallow but still has 4.4m. ENGLAND - South East Coast - South Falls W - Foul. A new FOUL in the south-west TSS lane west of the Mid Falls but in 50m of water not likely to hinder leisure craft. NETHERLANDS - Ribben Hinderplaat - Legends. symbol, entry prohibited (see Note) (a) at 51°53´·45N., 3°59´·29E. The Nature Reserve at the Ribben Hinderplaat is deleted and a prohibited area substituted. BELGIUM - Thorntonbank to Lodewijkbank - Works. Wind farm. Restricted area. Works are in progress to establish Rentel windfarm between Thorntonbank and Lodewijkbank. Mariners are advised to navigate clear of the limits of the construction area. Charts will be updated when works are complete. The area is now prohibited for passage between the Thorntonbank and Lodewijkbank wind farm for construction on additional wind turbines. Chart 1874 - International Chart Series, North Sea, Westerschelde Oostende to Westkapelle. Includes changes to the 'Off the Netherlands and Belgium coasts between West Hinder, North Hinder and Maas West’, traffic separation schemes, and amendments to radio reporting, buoyage and depths. continue to be used until these changes are implemented. Note: The chart numbers of the previous editions, are to be changed to ‘X….’ They will be updated independently and withdrawn shortly after the implementation date. FRANCE - North Coast - Ridens de Calais - Automatic Identification System. 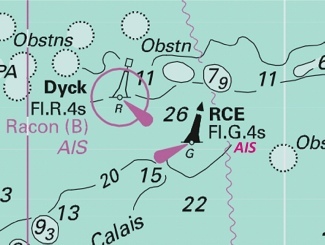 Automatic Identification System, AIS, at Ridens de Calais- RCA light-buoy 51° 01´·05N., 1° 48´·55E. Last week AIS was reported installed on the RCW off Calais. Now this week they are reporting the RCA north cardinal just east of the RCW is also now AIS fitted. 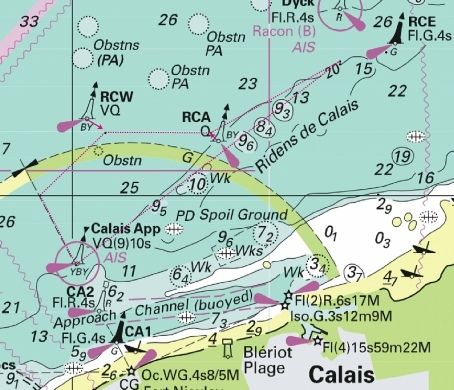 FRANCE - North Coast - Approaches to Calais - Automatic Identification System. 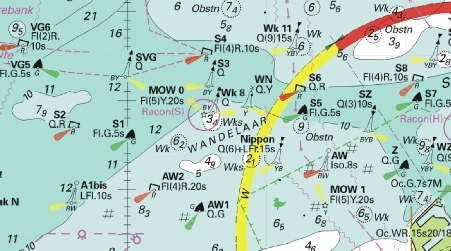 Automatic Identification System, AIS, at RCW light-buoy 51° 01´·00N., 01° 45´·84E. 1319 NORTH SEA - Belgium to Netherlands - Legends. Insert legend, Changes to TSS to be implemented on 1st June 2017 (see NM 765(P)/17 and NL NM 72(P)/17), centred on: 51° 46´·99N., 3° 16´·04E. and 51° 32´·97N., 3° 12´·45E. Insert legend, Changes to TSS to be implemented on 1st June 2017 (see NM 765(P)/17 and NL NM 72(P)/17), centred on: 51° 52´·14N., 3° 21´·81E. Insert legend, CHANGES TO TSS TO BE IMPLEMENTED ON 1 JUNE 2017 (SEE NM 765(P)/17), centred on: 51° 48´·57N., 3° 06´·53E., 51° 34´·70N., 3° 24´·37E. and 51° 29´·94N., 2° 42´·81E. Insert legend, Changes to TSS to be implemented on 1st June 2017 (see NM 765(P)/17 and NL NM 72(P)/17), centred on: 51° 53´·03N., 2° 25´·83E., 51° 47´·44N., 3° 10´·80E. and 51° 29´·11N., 2° 50´·83E. 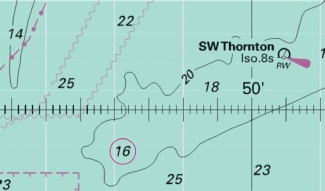 Insert legend, CHANGES TO TSS TO BE IMPLEMENTED ON 1 JUNE 2017 (SEE NM 765(P)/17), centred on: 51° 36´·33N., 3° 25´·60E., 51° 34´·83N., 3° 10´·86E., 51° 36´·11N., 2° 42´·69E and 51° 22´·26N., 2° 36´·74E. Insert legend, CHANGES TO TSS TO BE IMPLEMENTED ON 1 JUNE 2017 (SEE NM 765(P)/17), centred on: 51° 27´·10N., 2° 37´·70E., 51° 22´·51N., 2° 38´·34E. and 51° 26´·31N., 2° 56´·67E. Insert legend, CHANGES TO TSS TO BE IMPLEMENTED ON 1 JUNE 2017 (SEE NM 765(P)/17), centred on: 51° 36´·00N., 2° 43´·50E., 51° 25´·47N., 2° 43´·03E., 51° 27´·49N., 2° 57´·80E., 51° 35´·81N., 3° 08´·59E. and 51° 36´·01N., 3° 22´·45E. Insert legend, CHANGES TO TSS TO BE IMPLEMENTED ON 1 JUNE 2017 (SEE NM 765(P)/17), centred on: 51° 34´·1N., 3° 08´·2E. 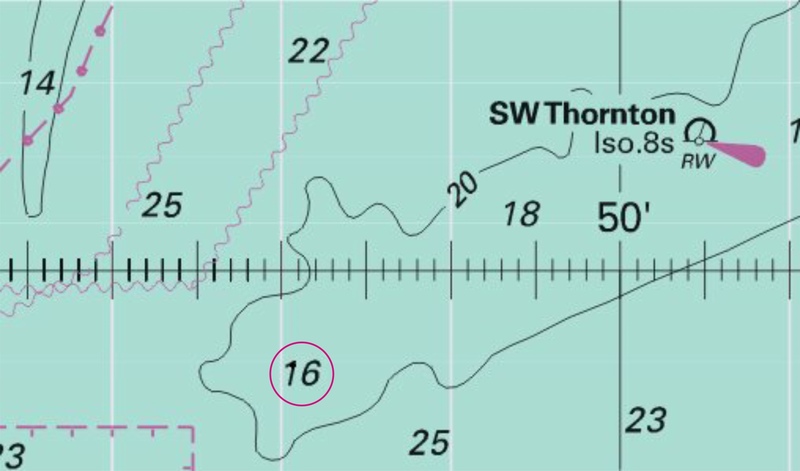 Insert legend, CHANGES TO TSS TO BE IMPLEMENTED ON 1 JUNE 2017 (SEE NM 765(P)/17), centred on: 51° 36´·66N., 2° 41´·15E., 51° 23´·78N., 2° 50´·25E. and 51° 34´·69N., 3° 11´·88E. Insert legend, CHANGES TO TSS TO BE IMPLEMENTED ON 1ST JUNE 2017 (SEE NM 765(P)/17), centred on: 51° 31´·0N., 3° 16´·0E. This is an addition to a legend on all of the charts in the relevant area regarding the notification given in Week 7, NtM 765(P). Refer back to Week 7 for the image please. NETHERLANDS - Bollen van Goeree N - Depths. depth, 20, with depth, 19.7 at 51° 56´·50N., 3° 42´·99E. depth, 12.8 , with depth, 11.8 at 51° 55´·66N., 3° 43´·38E. 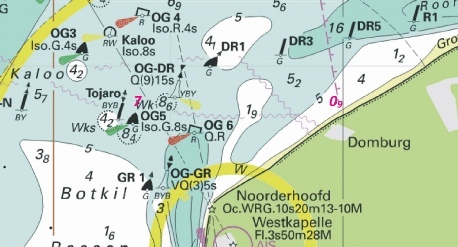 Two reduced depths in the Shipping anchorage north of the Bollen van Goeree (heading to the Hook of Holland). Unlikely to hinder leisure craft. FRANCE - North Coast - Fairy Bank W - Automatic Identification System. 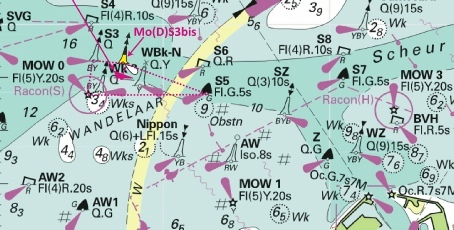 Automatic Identification System, AIS, at Fairy W light-buoy 51°23´·89N., 2°09´·27E. The Fairy West west cardinal buoy in the north-eastward Sandettie TSS now joins other buoys in the vicinity fitted with AIS. FRANCE - North Coast - Dyck Central - Automatic Identification System. Automatic Identification System, AIS, at DY 1 light-buoy 51° 08´·93N., 2° 14´·94E. A simple addition of AIS on the DY1 North Cardinal. BELGIUM - Akkaertbank W - Wreck. at 51° 21´·97N., 2° 38´·64E. New notification of a wreck in the approach shipping lane to Oostende but at 25m will not hinder leisure craft. NETHERLANDS - Slijkgat - Depths. depth, 1.5, and extend 2m contour W to enclose 51° 51´·02N., 3° 55´·85E. Delete depth, 1.6, close E.
New reduced depth on the approaches at the Slijkgat to Stellendam which is worth noting. FRANCE - North Coast - Dunkerque Port Ouest - Intake. Piles. Light. pile at 51° 01´·25N., 2° 10´·74E. and 51° 01´·23N., 2° 10´·77E. light to, VQ(6)8M at 51° 02´·25N., 2° 10´·81E. These developments are within the commercial west port of Dunkerque and consequently out of bounds of leisure craft. No image provided. NORTH SEA - Belgium to Netherlands - Routeing measures. Area to be avoided. 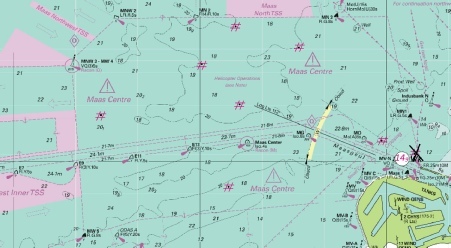 To improve safety of navigation, reduce the risk of marine environment pollution and the planned development of wind farm sites in the area between traffic separation schemes of West Hinder, North Hinder and Maas West, new and amended IMO adopted routeing measures come into force at 0000 UTC 1 June 2017.
a. The north-eastern end of the TSS “North Hinder South” will be shortened and the precautionary area “North Hinder Junction” will be extended to join the TSS. b. A new traffic separation scheme “Off North Hinder” will be established east of TSS “North Hinder South” adjoining the precautionary area “North Hinder Junction”. c. The eastbound traffic lane of TSS “Maas West Outer” will be amended. 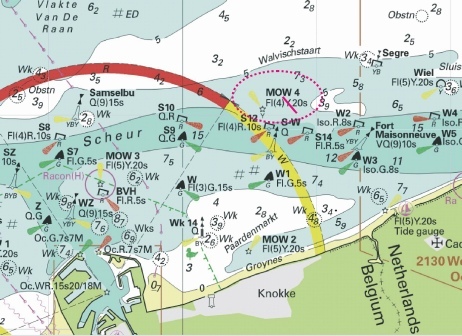 d. A new precautionary area “At Gootebank” will be established north of Deep Water route “In the Approaches to the River Scheldt”. e. The TSS “At West Hinder” will be shortened and the precautionary area “At West Hinder” will be extended to join the TSS. 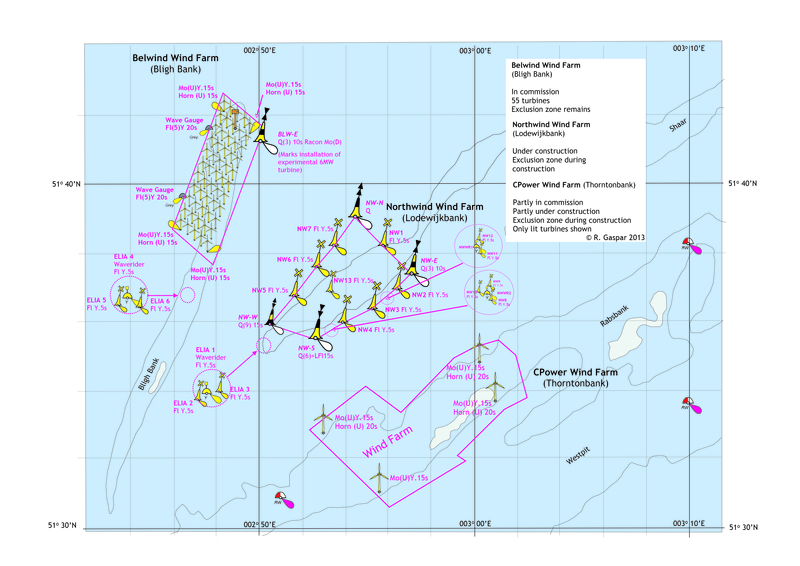 f. A new precautionary area “Windfarm Borssele” will be established north-east of the existing precautionary area “In the vicinity of Thornton and Bligh Banks”. 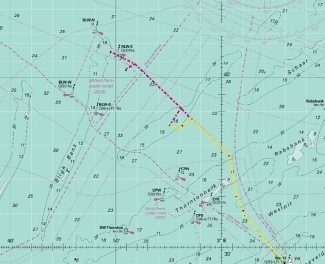 g. A new Area to be Avoided “Windfarm Borssele Pass” will be established through the precautionary area “Windfarm Borssele” for traffic under 45m in length. a. A new precautionary area “Schouwenbank Junction” will be established. This precautionary area is connected via a twoway route “Schouwenbank NW” to precautionary area “North Hinder Junction”; via a two-way route “Schouwenbank NE” to precautionary area “Maas Junction”; via a two-way route “Westpit” to precautionary area “At Gootebank” and via a two-way route “Schouwenbank SE” to the channel “Oostgat”. b. The anchorage area “Schouwenbank” will be adjusted according to the new two-way route “Schouwenbank NE”. 4. Details of all the above changes are shown on the accompanying diagram. 5. 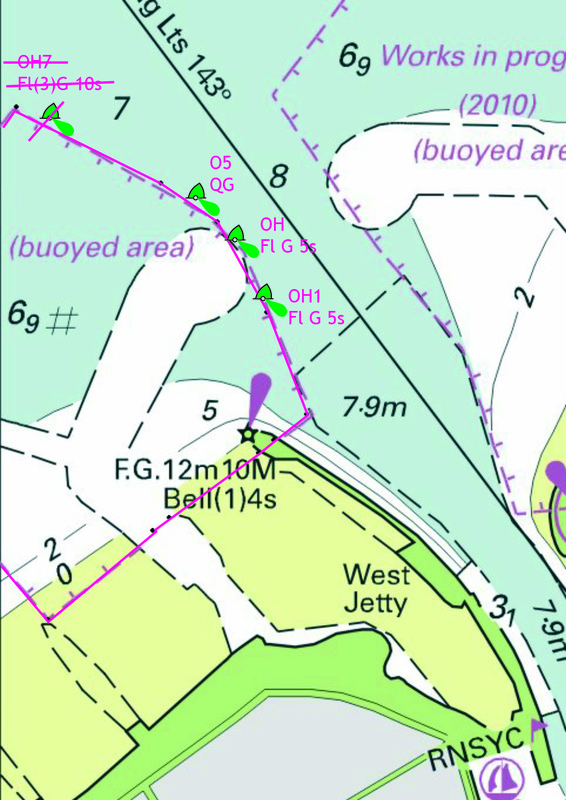 In addition to the above changes, radio reporting points, buoyage and anchorages will be amended and repositioned. The details of these changes will be published in the relevant NLHO and UKHO Publications. 6. Details of the routeing measures will be included in New Editions of Charts 110, 1406, 1630, 1872, 1873, 1874, and 2449 to be published in April 2017. 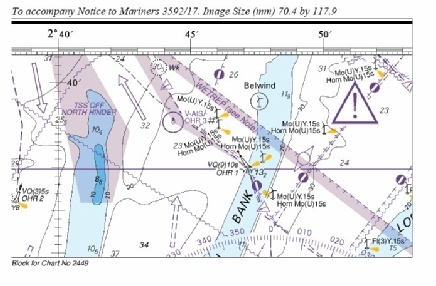 These charts will be published with a cautionary note advising mariners that the existing charts, which will be given an “X” prefix, should be retained and used until 0000 UTC 1 June 2017. A New Edition of Chart 8012 will be published in June 2017. Charts 122, 1408, 2182A and 5500 will be updated by Notice to Mariners. 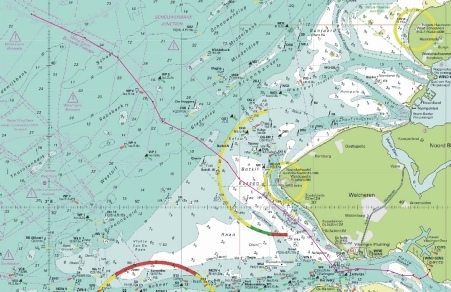 Note: Mariners are advised that this is a significant change to IMO routeing in the West Hinder, North Hinder and Maas West area. Mariners should familiarise themselves with these changes and ensure that they have all necessary chart and publication updates in advance of the implementation date. Prelimary notice of changes to be implemented on 1st June, 2017 of the shipping routing Belgium and Netherlands. BELGIUM - Westhinder to Schooneveld - Legends. Notes. Wreck. legend, Historic Wk (see Note), centred on: 51° 23´·76N., 2° 30´·64E. Wk Historic Wk (see Note) at 51° 29´·52N., 3° 06´·87E. the accompanying note, HISTORIC WRECKS, added to the marginal notes of relevant charts. The Belgium HO has notified that 8 wrecks have been designated as Historic Wrecks. 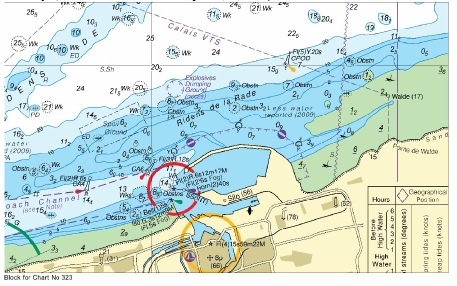 The wreck has a Temporary Exclusion Zone (TEZ) of 250 metres radius of the above position imposed by SOSREP. 1. Position : North East of the wreck in position Latitude 51° 40.289’N., Longitude 002° 13.632’E. Display Period : On 20 seconds. The word WRECK will be exhibited Black on Yellow. 2. Position : South East of the wreck in position Latitude 51° 40.174’N., Longitude 002° 13.641’E. Characteristics : Pillar: Blue & Yellow Vertical Stripes: Yellow Upright Cross Topmark: Alternating blue and yellow flashing light, where the blue and yellow 1 second flashes are alternated with an interval of 0.5 seconds. 3. Position : North West of the wreck in position Latitude 51° 40.283’N., Longitude 002° 13.449’E. 4. Position : South West of the wreck in position Latitude 51° 40.168’N., Longitude 002° 13.458’E. Characteristics : Pillar: Blue & Yellow Vertical Stripes: Yellow Upright CrossTopmark: Alternating blue and yellow flashing light, where the blue and yellow 1 second flashes are alternated with an interval of 0.5 seconds. Mariners are advised to give the wreck and buoys by which it is marked a wide berth. NORTH SEA - Netherlands Sector - Oosthinder N and S - Depths. depth, 16.5 at 51° 24´·17N., 2° 37´·98E. Delete: depth, 18.3, close N.
51° 37´·63N., 2° 41´·76E. (existing contour). depth, 10, and associated 10m contour 51° 38´·85N., 2° 41´·34E. depth, 11.1 at 51° 37´·13N., 2° 41´·41E. 1. A single reduction of depth to the north-east of the ‘AN’ port hand buoy on the edge of the Westhinder ship anchorage. Still 16.5m though. 2. A shift of the contour on the northern finger of the Oosthinder sand. Image shows the new shape and the existing 10m contour deleted. Again, 10m continues. Note that the Dutch chart block is available. BELGIUM - Negenvaam N - Depths. depth, 14.5 at 51° 21´·55N., 2° 42´·92E. Delete depth, 16.1 , close S and /or depth, 15.1 , close NW. Reduction of depth by the KB north cardinal buoy close to the Zeebrugge channel off north of Ostende (North the move of the north cardinal buoy was moved vide NtM 4167 several weeks earlier). FRANCE - North Coast - Approaches to Dunkerque - NM Blocks. Note:This update is included in New Editions 1350, published 17 November 2016 and 323, published 1 December 2016. Insert the accompanying block, centred on: 51°02´·7N., 2°08´·4E. Update of the changes at the approaches of Dunkerque usefully provided by the UKHO block which can be downloaded. FRANCE - North Coast - Approaches to Dunkerque - Automatic Identification Systems. Automatic Identification System, AIS, at DY3 light-buoy at 51° 11´·47N., 2° 22´·52E. 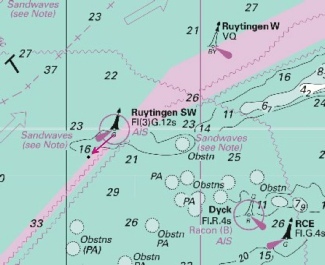 Automatic Identification System, AIS, at Ruytingen SE lightbuoy at 51° 09´·22N., 2° 08´·91E. BELGIUM - Wenduinebank SE - Submarine pipeline. Buoy. 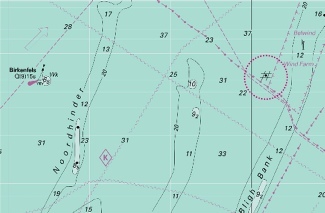 The pipeline is marked by a N cardinal light-buoy, Q DC1, in position 51° 15´·49N., 2° 57´·12E. 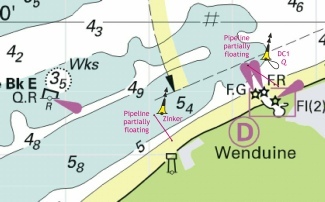 Mariners are requested not to anchor or fish in the vicinity of the pipeline and to navigate with caution in the area. Former Notice 2873(T)/16 is cancelled. New hazard inshore to the east of Ostend. ENGLISH CHANNEL - Le Colbart (The Ridge), Vergoyer - Automatic Identification Systems. 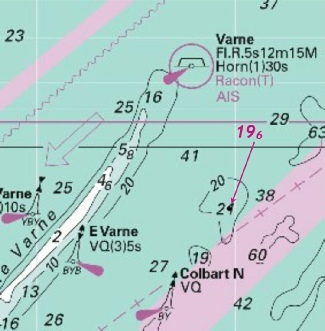 Automatic Identification System, AIS, at Colbart N light-buoy 50° 57´·47N., 1° 23´·32E. 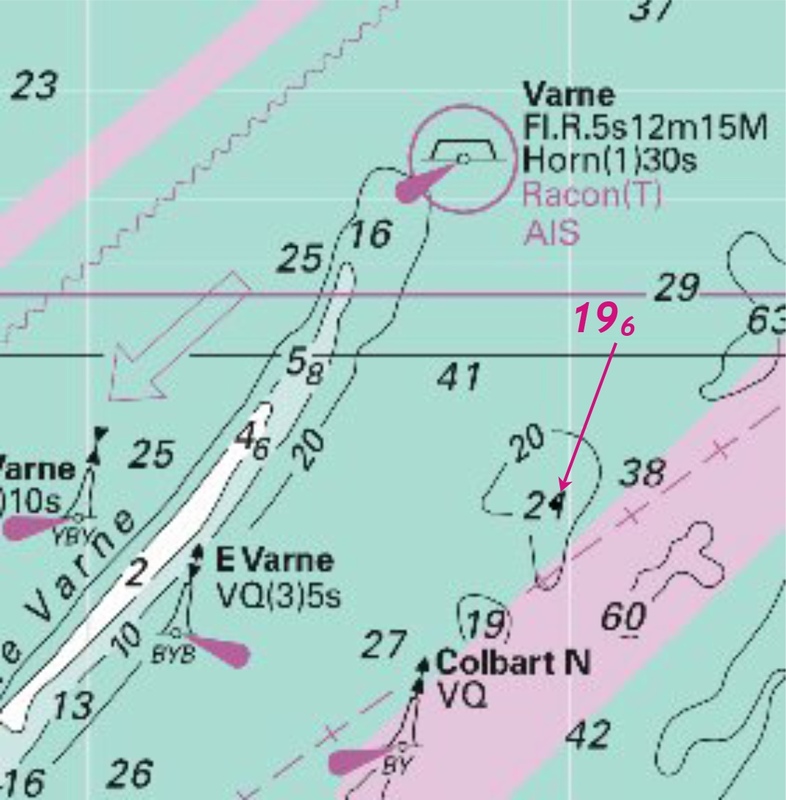 Automatic Identification System, AIS, at Vergoyer Nord-Ouest light-buoy 50° 37´·14N., 1° 17´·86E. Automatic Identification System, AIS, at Vegroyer SW lightbuoy 50° 27´·00N., 1° 00´·03E. 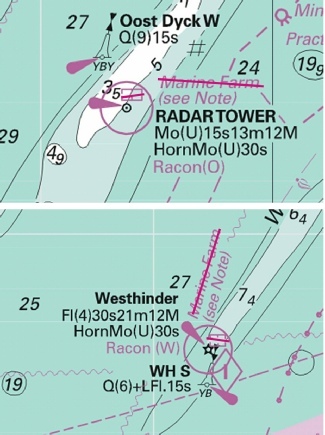 Automatic Identification System, AIS, at Vergoyer NW lightbuoy 50° 37´·1N., 1° 18´·1E. New AIS equipment in the English Channel. 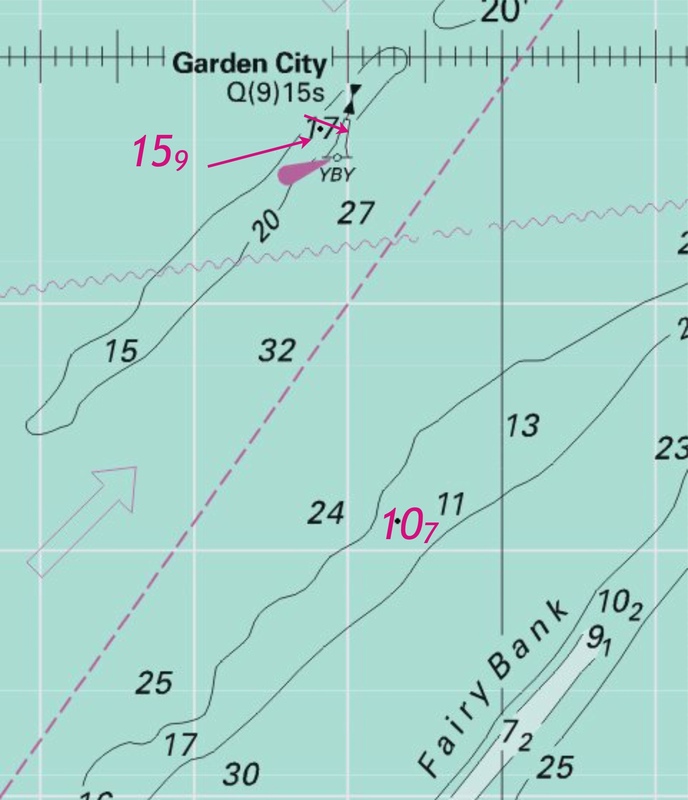 Apologies I am only able to illustrate the Colbart N light buoy, the other marks of the central TSS zone being further south out of the usual monitored area (but easy to identify). NORTH SEA - Netherlands Sector - TSS Maas West Inner - Buoy. Delete of the yellow round buoy Fl(5)Y 20s. This seems to be very adjacent to the E5 yellow cone buoy marking the Eurogeul DW route which has light characteristics of Fl(5)Y 10s. BELGIUM - Akkaertbank NW - Depth. depth, 19.1, enclosed by 20m contour at 51°24´·97N., 2°39´·39E. Delete depth, 24, close NW. Reduction of one depth in the Westhinder Shipping Anchorage. Unlikely to hinder leisure craft. NETHERLANDS - Vlissingen - Galgeput - Buoyage. Iso.R.4s OG 14A at 51°27´·27N., 3°31´·66E. VQ(3)5s OG-DL, from: 51°27´·85N., 3°30´·75E. to: 51°28´·07N., 3°30´·62E. VQ.G OG 19, from: (a) 51°27´·34N., 3°30´·98E. to: 51°27´·50N., 3°30´·74E. VQ.R OG 14, from: 51°27´·39N., 3°31´·47E. to: 51°27´·43N., 3°31´·43E. OG 12 light-buoy to, Iso.R.2s at 51°27´·88N., 3°31´·20E. 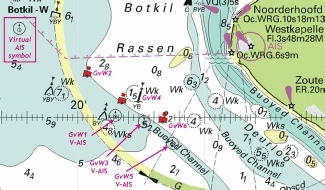 A variety of buoyage and characteristic changes at the Galgeput channel on the northern inshore approach to Vlissingen. BELGIUM - Zeebrugge - Buoyage. Fl(5)Y.20s (Wave Recorder) at 51°21´·40N., 3°10´·27E. Simple deletion of two special marks just off the west harbour wall of Zeebrugge. BELGIUM - Oostendebank SE - Buoy. Fl.Y.5s H20 at 51° 17´·28N., 2° 51´·73E. The Yellow Special Buoy H20 was deleted vide NtM 3964 of 2016 in week 31. Today it is back! Same position, same characteristics. Note also the change of lateral buoyage in the adjacent area in Week 42. NETHERLANDS - Westhoofd NW - Buoy. A north cardinal light-buoy, Q BO-North, has been temporarily established in position 51° 50´·12N., 3° 50´·26E. BELGIUM - Oostendebank SE - Buoyage. Fl(4)R.20s Oostendebank E, with Fl.G.5s Oostendebank E at 51°17´·35N., 2°51´·92E. 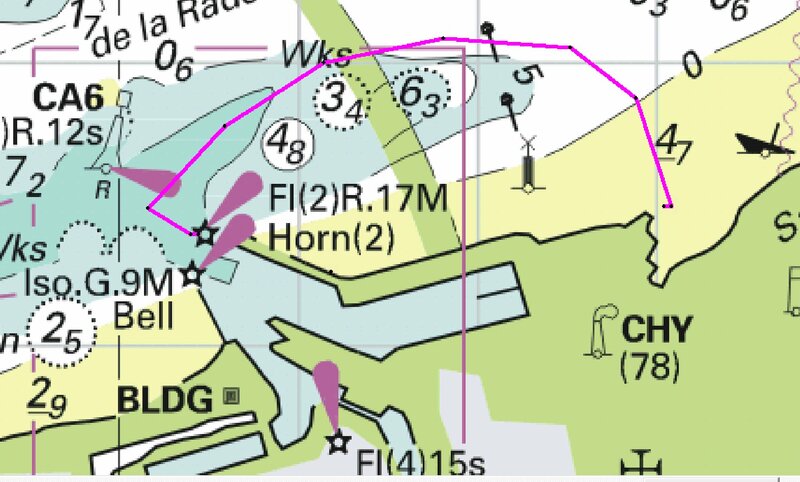 An unusual change of a port hand buoy for a starboard hand buoy at the Oostendebank E. This is a usual approach waypoint for leisure craft so the change is important. FRANCE - North Coast - Approaches to Calais - Fouls. Buoy. Fl(5)Y.20s Wave recorder, from: 50°58´·70N., 1°50´·11E. to: 50°58´·61N., 1°50´·12E. 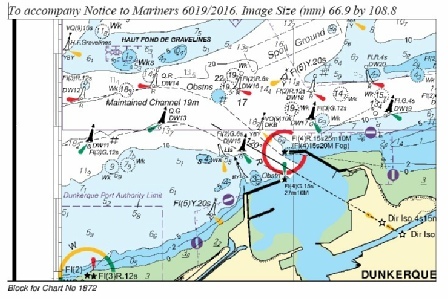 Three new Fouls in deep water; one wave recorder yellow special mark moved: note the wave recorder adjacent to the Ferry turning area. BELGIUM - Approaches to Oostende - Buoy. Fl.Y.5s H20 at 51°17´·28N., 2°51´·73E. This is a repetition of Week 31, Notice 3964 for some reason. The Yellow special mark is deleted. FRANCE - North Coast - Banc Smal W - Depth. depth, 8.6, with depth, 18.6 at 51° 05´·12N., 2° 19´·17E. This seems like a correction replacing the depth of 8.6m with 18.6m. This is in the middle of the unmarked channel north above the Rade de Dunkerque. BELGIUM - Gootebank NE, Westpit and Bol van Knokke - Fouls. This is three foul areas (2 probably too deep for leisure craft to be trying to anchor) but the third is feasible. Note the first foul area is within a Mine Laying Practice Area(!) and the second lies right next to a Gas pipeline(!). BELGIUM - Oostdyck N and Negenvaam - Buoyage. Radar beacon. VQ KB2, with Q KB at (a) 51° 21´·16N., 2° 42´·08E. Q OostdyckBk at 51° 21´·47N., 2° 31´·12E. Replace VQ KBk2, with Q KBk at (a) 51° 21´·04N., 2° 42´·22E. Q OostdyckBk at 51° 21´·38N., 2° 31´·12E. 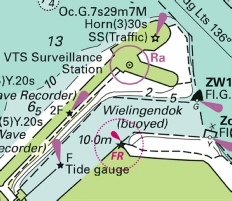 BELGIUM - Port Approach Guide Zeebrugge with Approaches to Westerschelde - Buoyage. Radar beacon. Replace north cardinal light-buoy KBk2 with north cardinal light-buoy KBk (a) 51°21´·04N., 2°42´·22E. This appears a complicated NtM but it is relatively straight forward. 1. The North Cardinal ‘KB2’ is deleted and the other adjacent North Cardinal ‘KB’ is moved (with the Racon (K) slightly between between where they both were. 2. The North Cardinal ‘Oostdyckbk’ close to its neighbour ‘OD1’ is deleted. There is also a Preliminary NtM (4202(P) about the same changes but this is notifying to the Port Approach Guide Chart 8012. Note there is slight Lat/Long because of the datum. 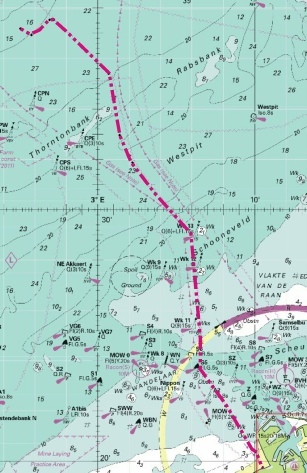 BELGIUM - Approaches to Oostende and Approaches to Zeebrugge - Buoyage. Fl(5)Y.20s (Wave Recorder) at 51°21´·58N., 3°07´·27E. 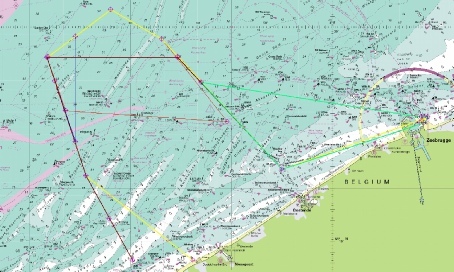 Deletion of three special buoys, two on the approach to Zeebrugge and one off Ostende. Note these special marks are not shown on the base image but were very adjacent to existing navigation buoys that are still in place. NETHERLANDS - Europoort SW - Gat van de Hawk - NM Blocks. Insert the accompanying block, centred on: 51°55´·0N., 3°59´·4E or on: 51°54´·8N., 3°59´·3E. according to UKHO chart scale. Probably unusual territory: two blocks of the same area but different scale. The first image shows the location. NETHERLANDS - Cadzand-Bad NW - Beacon. Lights. F.R at 51° 22´·82N., 3° 22´·92E. with F.G 51° 22´·86N., 3° 22´·90E. Slightly enigmatic as I have never heard of the record of a beacon at this point but this lies within the Thorntonbank Wind Farm and consequently it is forbidden for leisure craft to go in the Wind Farm. FRANCE - North Coast - Binnen Rattel N - Buoy. Measuring instrument. Automatic Identification System. UKHO Charts: 323, 1610, 1872, 1873 and 2449. 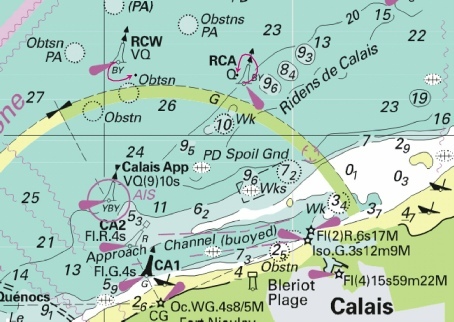 A measuring buoy including an AIS has been placed in the channel (one of the offshore channels north of Dunkerque) north of the Binnen Ratel. NETHERLANDS - Steendiep - Depths. depth, 8.9, and extend 10m contour NW to enclose 51° 34´·77N., 3° 18´·29E. Three reduction of depths in the Steendiep (on route to the Hook of Holland) but the depths should not hinder leisure craft. BELGIUM - Blankenberge W and Oostende N - Buoyage. Fl(5)Y.20s (Wave Recorder) at 51°18´·99N., 3°06´·10E. The first buoy (wave recorder is deleted just north of the Blankenberge harbour, the second just east of the Ostende harbour entrance. BELGIUM - Wandelaar - Wreck. Restricted area. Light. Buoyage. Ongoing salvage operations are taking place on the wreck of Flinterstar, in position 51°24´·01N., 3°03´·72E. Light MOW 0 Fl(5)Y.20s Racon(S) 51°23´·67N., 3°02´·75E. North cardinal light-buoy S3 Q 51°24´·30N., 3°02´·92E. North cardinal light-buoy S3bis Mo(D) 51°24´·24N., 3°03´·80E. 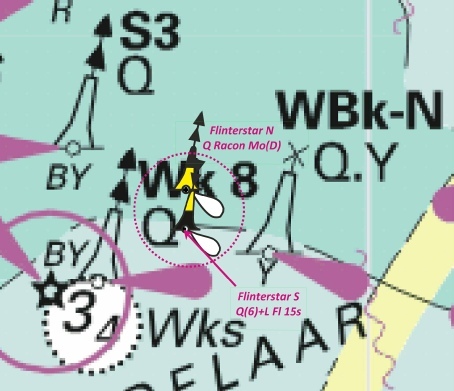 North cardinal light-buoy Flinterstar-N Q Racon Mo(D) 51°23´·96N., 3°04´·82E. South cardinal light-buoy Flinterstar-S Q(6)+LFl.15s 51°23´·67N., 3°04´·82E. To avoid causing swell, mariners are advised to keep to a moderate speed in the fairway between buoys S3 and S4 and between buoys S5 and S6. A guard vessel is always on standby and can be contacted on VHF channels 16 and 69 for the latest information. This problem was first report in Week 51 of 2015 NtM 6404(T)/2015. This now adds the restricted area, entry prohibition and directs ships to moderate speeds. *The pipeline is marked by a N cardinal light-buoy, Q DC1, in position 51° 17´·99N., 3° 03´·16E. Former Notice 2289(T)/16 is cancelled. * Indicates new or revised entry. This indicates a revised position (to the west) as previously recorded by Notice 2289(T) in week 18. BELGIUM - Blighbank - Works. Wind farm. Buoyage. Restricted area. Works are in progress to extend the Belwind windfarm at Blighbank in position 51° 40´·35N., 2° 48´·40E. This is a revised preliminary notice. This indicates to very small moves in relation of two of the perimeter buoyage and the addition of two wave recorders within the construction area. Chart 1350 International Chart Series, France - North Coast, Dunkerque and Approaches. Includes changes to depths and lights. (A modified reproduction of INT1482 published by France). FRANCE - North Coast - Approaches to Dunkerque - Wrecks. Obstructions. Fouls. Legends. legend, Less water reported, centred on: 51° 04´·60N., 2° 23´·79E. legend to, Obstn, centred on: 51° 03´·24N., 2° 08´·15E. legend to, Wk, centred on: 51° 03´·45N., 2° 13´·95E. at 51° 03´·36N., 2° 08´·45E. at 51° 03´·80N., 2° 14´·72E. at 51° 03´·98N., 2° 20´·16E. at 51° 04´·09N., 2° 20´·58E. at 51° 03´·82N., 2° 21´·55E. at 51° 03´·83N., 2° 21´·75E. at 51° 02´·93N., 2° 05´·23E. at 51° 03´·15N., 2° 06´·74E. at 51° 03´·48N., 1° 51´·46E. Note: This update is included in New Edition 1350, published 19th May 2016 and New Edition 323, published 29th July 2016. Former Notice 4640(T)/13 is cancelled. This is a major survey by the French of the wrecks to the west and east of Dunkerque. With the exception of the ‘less water reported’ item which is already marked as a shoal, the revision of the wrecks are improvements – in the sense that the depths over the wrecks have increased or been altered to FOULS rather than a wreck. No changes are likely to hinder leisure craft. I will attempt to add images if suitable shortly. BELGIUM - Westhinder SW - Buoy. Fl(5)Y.20s (Wave Recorder) at 51° 22´·86N., 2° 26´·39E. Simple delete of a yellow special buoy (Wave Recorder) very adjacent to the Westhinder cardinal buoy. 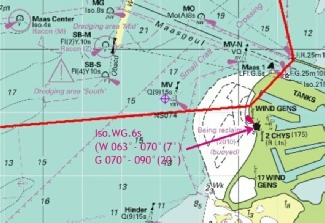 The pipeline is marked by a N cardinal light-buoy, Q DC1, in position 51° 18´·76N., 3° 04´·49E. The pipeline quoted comprising parts floating, parts submerged marked by a North Cardinal buoy running out off the shore flats directly to sea. BELGIUM - Approaches to Oostende - Vaargeul 1 W - Buoy. Fl.Y.5s H15 at 51° 24´·98N., 2° 49´·55E. Simple delete marking one of the special marks in between the major Deep Water route towards Zeebrugge. 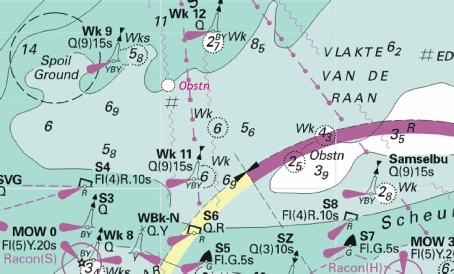 BELGIUM - Approaches to Nieuwpoort - Obstruction. 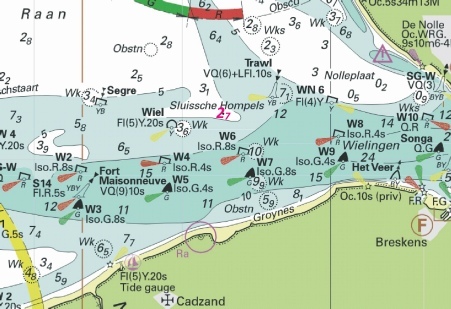 Note this damaged pile if passing to and fro the Nieuwpoort channel. NETHERLANDS - Approaches to Europoort - Bollen Van Goeree NW - Foul. at 51° 55´·20N., 3° 42´·80E. 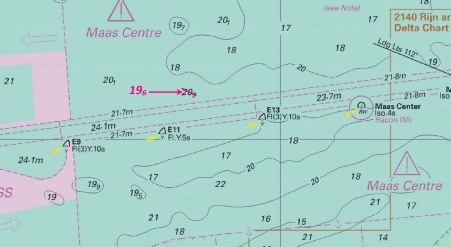 A foul adjacent to the ODAS B special yellow buoy In the inshore traffic zone towards Europort in approximately 13m of depth. Works are in progress to extend the Belwind windfarm at Blighbank, position 51° 40´·35N., 2° 48´·40E. Unauthorised vessels are not permitted to enter the construction area. Mariners are advised to navigate well clear of the limits of the construction area. 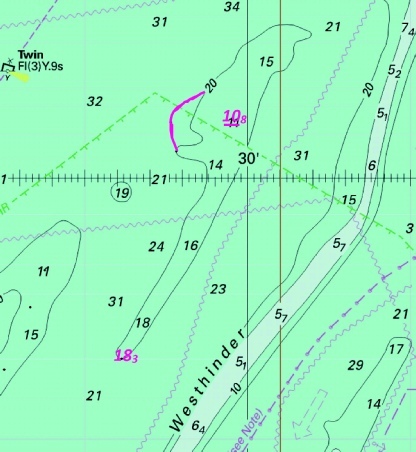 Restricted and well marked area of the enlargement of the Belwind wind farm on the Blighbank in Belgium waters. Restriction is absolute in Belgium waters. NORTH SEA - Netherlands Sector - Buitenbanken - Anchorage 4 West - NM Block. the accompanying block, centred on: 51° 53´·8N., 3° 31´·5E. 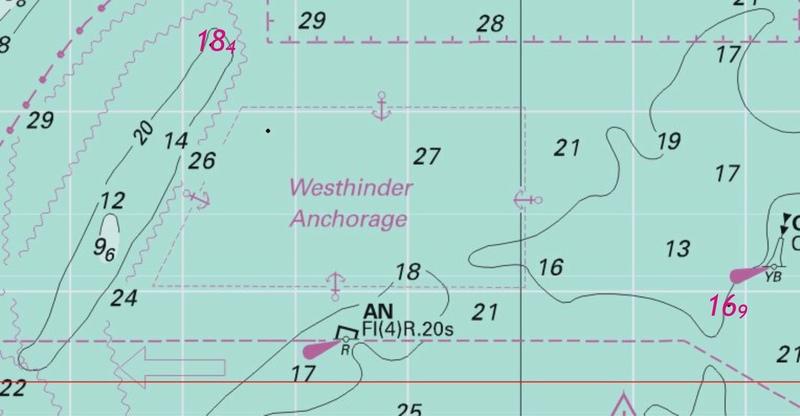 former limit of anchorage area, pecked line, joining: (a) above and 51° 52´·50N., 3° 24´·75E. 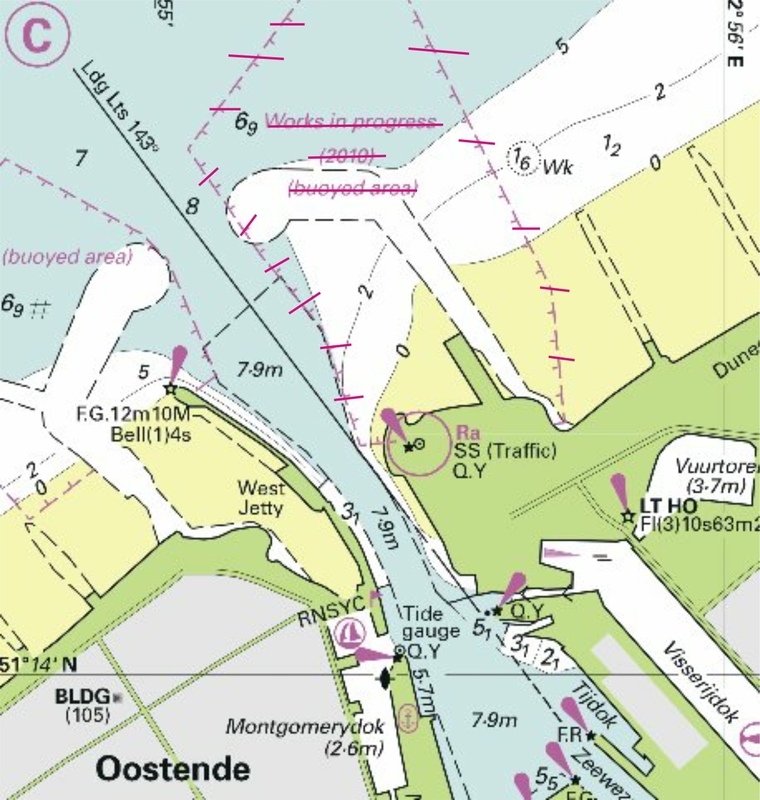 The shipping anchorage adjacent to the Maas West Inner TSS has been expanded. There is a block from the UKHO and an image showing the expansion. FRANCE - North Coast - Sandettié Bank NE - Automatic Identification System. 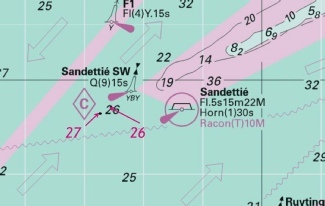 Automatic Identification System, AIS, at Sandettié E lightbuoy at 51° 14´·88N., 2° 02´·63E. The family of AIS transmitters around the Sandiettie has been added by the Sandiettie E.
956(T)/2016 FRANCE - North Coast - Dunkerque Port Ouest - Restricted areas. 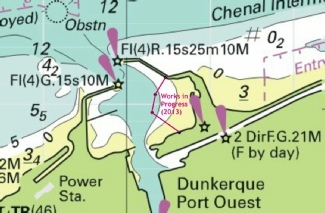 Temporary restricted area to the east and west of the Dunkerque Ouest Port. BELGIUM - Oostende and Approaches - Foul. Lights. F.G.3M at 51° 14´·44N., 2° 54´·96E. F.R.3M at 51° 14´·51N., 2° 55´·18E. at 51° 26´·70N., 2° 44´·90E. 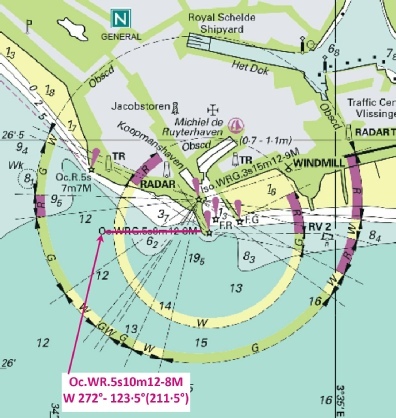 Two new lights at the entrance of the Outer Harbour of Oostende and a new Foul much further out close to the Goote Bank in 20+m. NORTH SEA - Netherlands Sector - Buitenbanken - Depths. depth, 19.9, with depth, 19.3 at 51° 55´·04N., 3° 35´·32E. depth, 18.9, with depth, 18.3 at 51° 53´·38N., 3° 26´·63E. Three very slight reductions of depth over the Buitenbanken; unlikely to be relevant to leisure vessels. 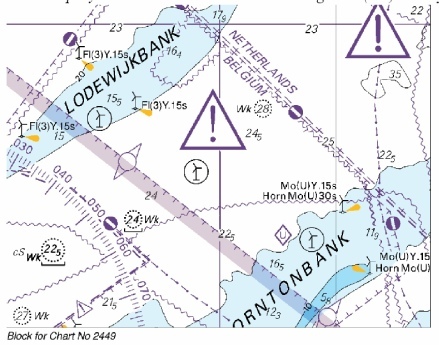 NETHERLANDS - Approaches to Europoort - Fouls. Wreck. with at 52° 00´·25N., 4° 01´·52E. Delete at 52° 00´·41N., 4° 02´·27E. 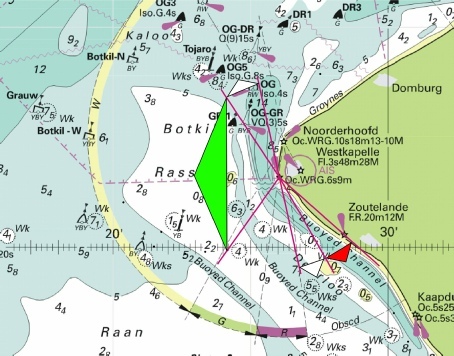 14 Fouls marked in the approaches to the Hook of Holland, a slight reduction of the depth over a wreck on the close approaches to the Hook of Holland and one deletion. NETHERLANDS - Westerschelde - Vlissingen - Signal station. SS(Storm) at 51° 26´·48N., 3° 35´·75E. NETHERLANDS - Approaches to Vlissingen - Buoyage. OG 14 VQ.R 51° 27´·23N., 3° 31´·74E. OG 12 Iso.R.4s 51° 27´·43N., 3° 31´·38E. A port-hand lateral light-buoy, OG 10A, Iso.R.2s, has been established in position 51° 27´·81N., 3° 31´·27E. 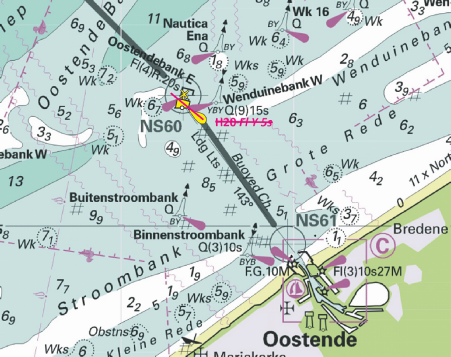 The yellow buoy, Westduin, has been removed from position 51° 27´·39N., 3° 31´·69E. Temporary changes to the channel off Kaapduinen. The image is used from Temporary notice 2955(T) in Week 24 of 2015. FRANCE - North Coast - Approaches to Calais - Works. Explosives dumping ground. Navigation is prohibited within 500m of the works area. An explosives dumping ground has been established in position 51° 00´·6N., 1° 52´·8E. Only a temporary notice of works but very close to the outer harbour and environs. Worth keeping well clear! Note: This chart is to be deleted from the list of charts affected by Notices 4640(T)/13 and 4403(P)/14. This chart remains affected by Notice 811(T)/12. Includes changes to depths, wrecks and obstructions (A modified reproduction of INT1482 published by France). FRANCE - North Coast - Calais - Light. A new light inside the Avant Port of Calais. The lights are very limited in sectors width. 6404(T)/15 BELGIUM - Wandelaar - Wreck. Restricted area. Buoyage. North cardinal light-buoy Flinterstar-N Q Racon Mo(D) at 51°24´·12N., 3°03´·70E. South cardinal light-buoy Flinterstar-S Q(6)+LFl.15s at 51°23´·94N., 3°03´·70E. 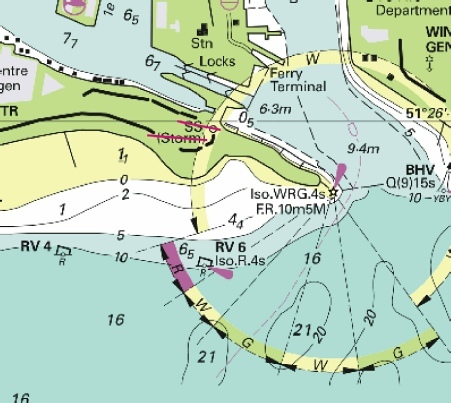 A restricted area, entry prohibited, radius 0·15M, has been established centred on the wreck. A guard vessel is always on standby and can be contacted on VHF channels 16, 67 and 69 for the latest information. Former Notice 5666(T)/15 is cancelled. Changes at the site of the Flinterstar wreck. 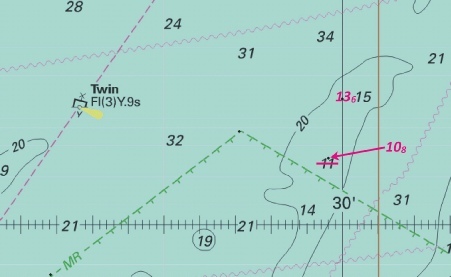 Two adjusted cardinals, north and south middle way in between the site of the wreck and a 0.15nm restricted area. BELGIUM - Fairybank to Oostende and Zeebrugge - Marine Reserve. Restricted area. Note. the accompanying note, MARINE RESERVES, centred on: 50°57´·88N., 2°17´·75E. the accompanying note, MARINE RESERVES, centred on: 51°17´·88N., 1°04´·01E. 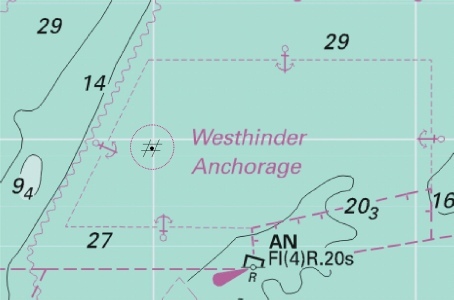 These marine reserves are a little confusing on the various UKHO charts as reported above. But the general spread gives the sense. FRANCE - North Coast - Approaches to Dunkerque - Obstruction. at 51° 03´·54N., 2° 08´·55E. A wreck over 19m unlikely to trouble leisure craft. NORTH SEA - Netherlands Sector - Approaches to Europoort - Buoyage. MNW1 light-buoy to, LFl.G.8s 52° 06´·62N., 3° 30´·19E. MW3 light-buoy to, LFl.G.5s 51° 54´·10N., 3° 24´·29E. 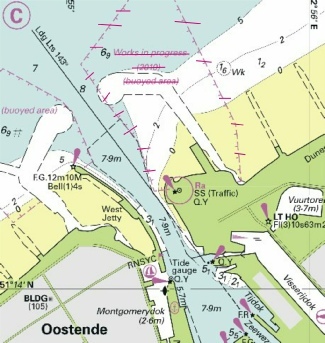 The starboard hand light buoy MNW 1 is moved to the starboard edge of the Maas Northwest TSS. MW3 is ‘said’ to be amended but in fact remains in the same position as currently shown on the image. BELGIUM - Wandelaar - Wreck. Restricted areas. Buoy. Salvage operations are taking place on the wreck of Flinterstar, in approximate position 51° 24´·01N., 3° 03´·72E. 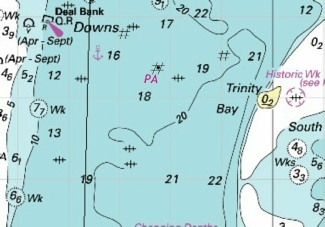 The wreck is marked by a north cardinal light-buoy, Mo(D) S3bis, in position 51° 24´·24N., 3° 03´·80E. 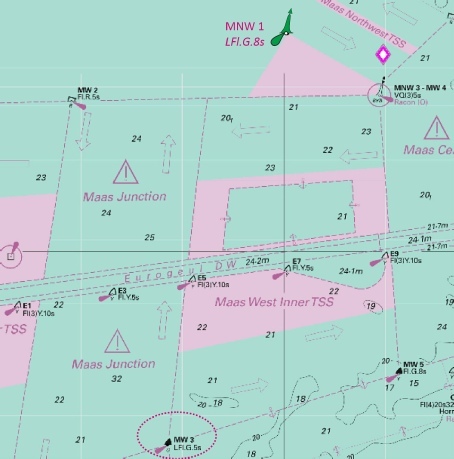 A restricted area, entry prohibited, has been established between buoys S3, S3bis, S5 and measuring post MOW-0. Fishing is prohibited within a radius of 1M of the wreck. Image courtesy of Imray Chart C30 and Meridian ID10. Chart 1872 North Sea, Dunkerque to Vlissingen. Includes changes to depths, wrecks, obstructions, anchorages and VTS limits. (A modified reproduction of INT1483 published by France). reproduction of Belgian chart D11). NETHERLANDS - Westkapelle W - Buoyage. Note: This update is included in New Edition 1872, published 29th October 2015. GR 7 at 51° 31´·34N., 3° 24´·52E. designation of buoy to, GR 9 at 51° 30´·93N., 3° 24´·47E. 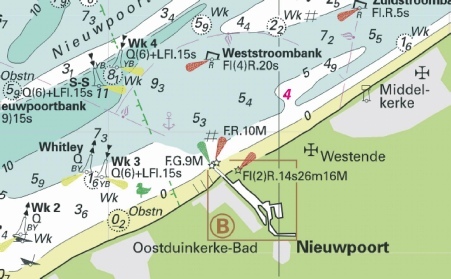 One revised and one new starboard unlit buoy for the West Westkapelle channel. BELGIUM - Blankenberge and Akkaertbank SE - Light. Radio reporting point. LNG Vessels, direction of vessel movement 053° at 51° 22´·14N., 2° 53´·46E. Fl(3)Y.20s10m4M at 51° 19´·29N., 3° 08´·18E. The radio reporting for LNG vessels are adjacent to the A1 safe water buoy approaching to Zeebrugge. The light on the coast east of Blankenberge is now deleted. 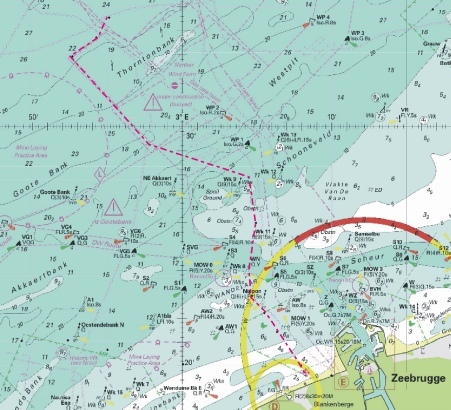 NETHERLANDS - Approaches to Europoort - Fouls. 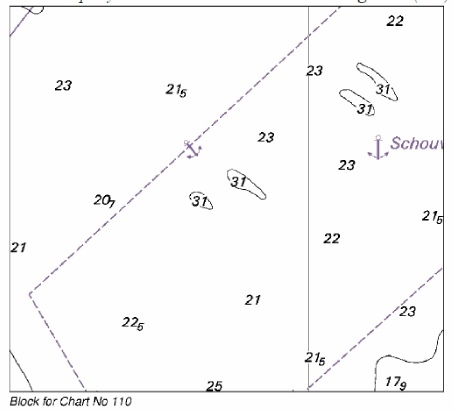 Three fouls within the shipping anchorages just south of the Maas West Inner TSS. Unlikely to hinder leisure craft. BELGIUM - Blankenberge - Depths. 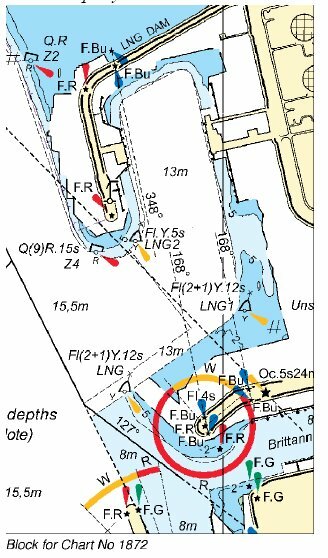 Shoal depths have been reported between the pier heads at Blankenberge, in the vicinity of position 51°18´·9N., 3°06´·5E. Shoaling at the entrance to Blankenberge. The area of concern is right in the middle of the entrance as indicated on the image below. This is derived from Belgium Notices but no additional information is available from those notices other than further information may be available from the MRCC Ostend. NETHERLANDS - Westkapelle SE - Light. light to, F.22m12M at 51°30´·28N., 3°28´·41E. Image courtesy of Imray C30 and Meridian ID10. Change of light characteristics on the Westkapelle light north of Vlissingen. BELGIUM - North Hinder South TSS - Depth. depth, 19.2, enclosed by 20m contour at 51° 35´·33N., 2° 18´·17E. A new reduced depth in the middle zone between the lanes at the North Hinder South TSS. This depth is unlikely to hinder leisure craft. FRANCE - North Coast - Calais NW - Waiting area. Note. (b) 51° 01´·00N., 1° 45´·84E. (c) 50° 58´·89N., 1° 45´·09E. 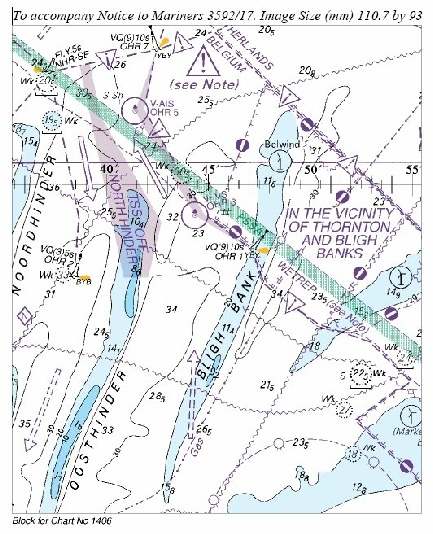 the existing note, APPROACH CHANNELS AND WAITING AREA FRENCH REGULATIONS, with the accompanying note, APPROACH CHANNELS AND WAITING AREAS FRENCH REGULATIONS, centred on: 50° 59´·18N., 2° 10´·37E. Redefinition of the waiting area north of Calais for shipping. 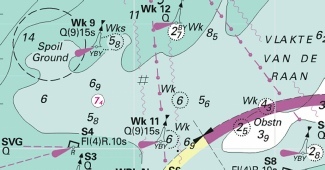 Note that the two buoy moves indicated occurred back in Week 9 vide NtM 1063 of 2015. Includes changes to depths and buoyage. (A modified reproduction of INT1480 published by Belgium). Includes changes to depths and buoyage. (A modified reproduction of INT1474 published by Belgium). 3983(T)/15 BELGIUM - Approaches to Oostende - Submarine pipeline. Mariners are requested not to fish or anchor in the vicinity of the pipeline and to pass at a safe distance. Although described in the notice as the approach to Oostende, this floating pipeline is actually closer to Nieuwpoort being to the east of the town close to shore. 4036(T)/15 NETHERLANDS - Approaches to Vlissingen - Buoyage. Depths. OG 12 Iso.R.4s 51° 27´·43N., 3° 31´·88E. A port-hand lateral buoy, OG 10A, has been established in position 51° 27´·81N., 3° 31´·27E. 6·6m 51° 27´·32N., 3° 31´·48E. 6·2m 51° 26´·40N., 3° 33´·75E. Former Notice 3618(T)/15 is cancelled. This notice adds to previous temporary notices that have been published but only adds one new change to those previously notified which is a move to OG12. The culmulative effect is as illustrated. FRANCE - North Coast - Dyck Occidental and Dunkerque Port Ouest - Buoyage. Lights. Wreck. light to, Dir Iso.4s15m17M (F Day) at 51°01´·67N., 2°11´·92E. light to, Dir Iso.4s29m17M (F Day) at 51°01´·51N., 2°12´·37E. Dyck Fl.R.4s and associated Automatic Identification System, AIS, and radar beacon, Racon(B), from: 51°02´·99N., 1°51´·79E. to: 51°02´·90N., 1°51´·78E. Fl.G.4s RCE and associated Automatic Identification System, AIS, from: 51°02´·45N., 1°53´·23E.to: 51°02´·29N., 1°52´·98E. UKHO Admiralty Charts: 323, 1350, 1351, 1406, 1610, 1872, 1892 and 2449. 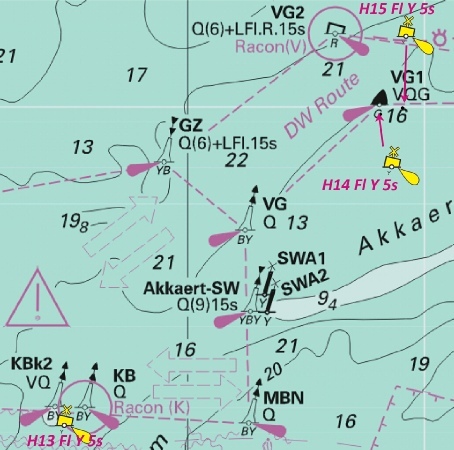 Some small moves of some of the buoys marking the approach to Dunkerque and a change of light characteristics within the commercial harbour. BELGIUM - Westhinder E - Foul. This is a repeat of Notice 3014 from week 24 but this time to update charts 1872 and 1873 that were omitted from that notice. NETHERLANDS - Vlissingen - Buoyage. Virtual aids to navigation. GvW 6 at 51°29´·89N., 3°23´·36E. symbol, virtual aid to navigation, starboard-hand topmark, V-AIS GvW 1 at 51°30´·01N., 3°21´·50E. symbol, virtual aid to navigation, starboard-hand topmark, V-AIS GvW 3 at 51°29´·85N., 3°22´·63E. This is formal establishment of Notice 652(T) from week 7 with the slight change in that the symbol for the port hand marks has changed to that shown below. NETHERLANDS - Westkapelle - Light. 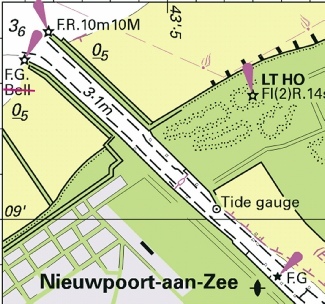 Changes to the light sectors to the Westkapelle coastal light (Walcheren, Holland). 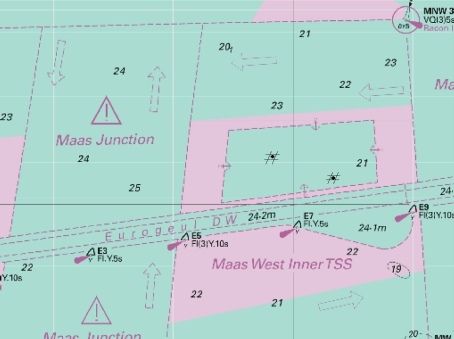 NORTH SEA - Netherlands Sector - TSS Maas West Inner - Fouls. Two fouls in the Anchorage at the Maas West Inner Anchorage. The depth means these are unlikely to hinder leisure craft. BELGIUM - Koksijde-Bad N to Zeebrugge NE - Depths. These and other changes will be included in the next New Edition of Charts 1872, 1873 and 1874. A little bit of a mystery. All but one of the new depths has already been notified vide Notice 1425(P) in week 12. The one new entry is indicated by the star and only this is plotted on the image. Please see the images in Week 12 for the previous ‘new’ depths. NETHERLANDS - Vlissingen NE - Buoyage. Iso.G.8s OG 17A at 51° 28´·50N., 3° 30´·22E. VQ(3)5s OG-DL, from: 51° 28´·20N., 3° 30´·59E. to: 51° 27´·85N., 3° 30´·75E. VQ.G OG 19, from: 51° 27´·49N., 3° 30´·82E. to: 51° 27´·34N., 3° 30´·98E. Iso.G.4s OG 21, from: 51° 27´·13N., 3° 31´·39E. to: 51° 27´·05N., 3° 31´·53E. NETHERLANDS - Approaches to Vlissingen - Buoyage. Depths. SG-W VQ(3)5s 51° 26´·30N., 3° 33´·95E. SG 3 Iso.G.4s 51° 26´·72N., 3° 33´·21E. This and the following notice are combined into one image. 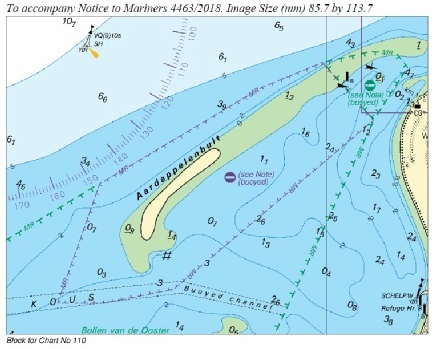 This notice deals with one new buoy and three moves in the buoyed channel off Kaapduinen, Holland (note only the new and moved buoys are shown in the image). The second notice details four further moves and two new depths in the same channel. BELGIUM - Westhinder E, Lodewijkbank N and Vlakte van de Raan. - Obstruction. Fouls. at 51° 26´·82N., 3° 05´·21E. at 51° 24´·89N., 2° 34´·98E. at 51° 39´·27N., 2° 53´·84E. Three seabed obstructions/Fouls but in places and at depths that should not trouble leisure craft. Yachting buoy “KYCN”, with light character Fl.Y.5s, is temporarily established in position 51°09,88’N 002°43,00’E. This special marking buoy is a yellow pillar with radar reflector and a yellow lying cross as topmark. Shipping is requested to pass with caution. 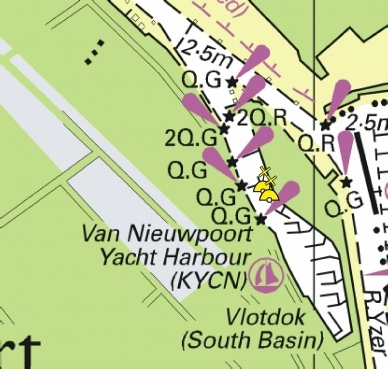 Two new special marks within Nieuwpoort harbour marking shoals. BELGIUM - Bligh Bank - Restricted area. Wind turbine. Light. symbol, wind turbine, Mo(U)Y.15s Horn Mo(U)15s from: 51° 41´·54N., 2° 49´·74E. to: 51° 41´·30N., 2° 50´·19E. A small extension to the prohibited area surrounding the Belwind Wind Farm on the Bligh Bank in Belgium waters: note it is not permitted to transit through Wind Farms in Belgium waters). Move of the fog signal to a turbine within the newly defined area. FRANCE - North Coast - Calais N - Buoy. Fl(5)Y.20s CPOD at 51° 00´·02N., 1° 52´·78E. BELGIUM - Approaches to Oostende - Buoyage. Fl(5)Y.20s (Wave Recorder) at 51° 16´·39N., 2° 26´·68E. Fl.Y.3s at 51° 14´·86N., 2° 55´·63E. Removal of two special marks, one by the Oost Dyke West Radar Tower, the other to the eastern side of Ostende Harbour. NETHERLANDS - Kous - Buoyage. Removal of 4 yellow posts adjacent to the Kous nature reserve off the Dutch coast at the Middleplat. 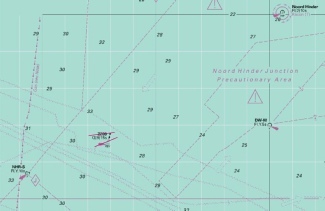 NORTH SEA - Netherlands Sector - North Hinder Junction - Buoyage. Radar beacons. 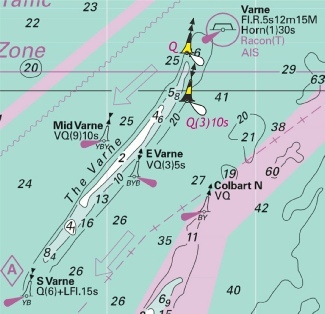 VQ WRECK N BA at 51°52´·16N., 2°53´·77E. 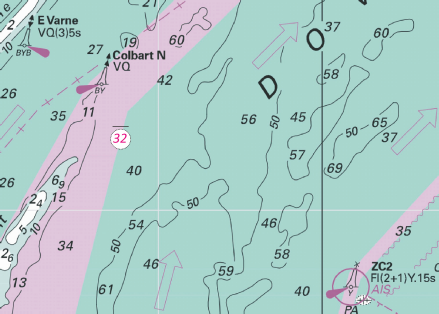 VQ(3)5s WRECK E BA at 51°51´·32N., 2°55´·68E. 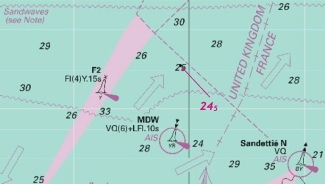 VQ(6)+LFl.10s WRECK S BA at 51°50´·69N., 2°54´·30E. 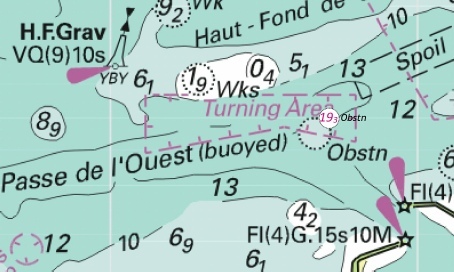 VQ(9)10s WRECK W RACON at (a) 51°51´·32N., 2°52´·78E. 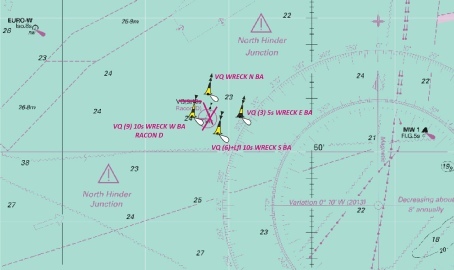 VQ(9)10s Wreck and associated radar beacon, Racon(D) at 51°51´·39N., 2°53´·97E. Re-marking of a wreck at the North Hinder, now with 4 cardinal marks instead of the previous 1. 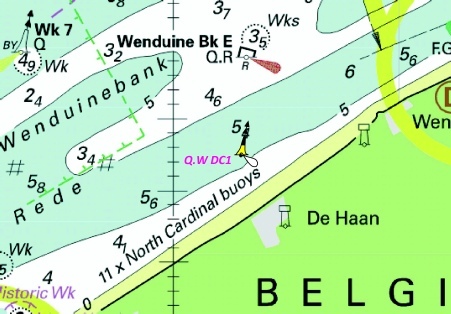 2199 BELGIUM - Wenduinebank NW - Buoy. Fl(5)Y.20s (Wave Recorder) at 51°21´·14N., 2°53´·01E. A new wave recorder situated right by the Oostendbank N North Cardinal.buoy. Fl.Y H18 at 51° 17´·43N., 2° 51´·73E. Fl.Y H20 at 51° 17´·28N., 2° 51´·73E. Two new yellow special buoys adjacent to the Ostendebank E buoy on the approaches to Ostende. NETHERLANDS - Schouwenbank W - NM Block. Insert the accompanying block, centred on: 51°46´·9N., 3°19´·1E. A pretty unexciting replacement block covering part of the Schouwenbank ship anchorage. This is over 13 miles SSE from the Dutch shore. No implications for leisure craft are obvious. BELGIUM - Negenvaam N and Gootebank S - Buoyage. Fl.Y.5s H13 at 51° 20´·79N., 2° 42´·39E. Fl.Y.5s H14 at 51° 24´·90N., 2° 49´·09E. UKHO Admiralty Charts: 1872, 1873 and 1874. 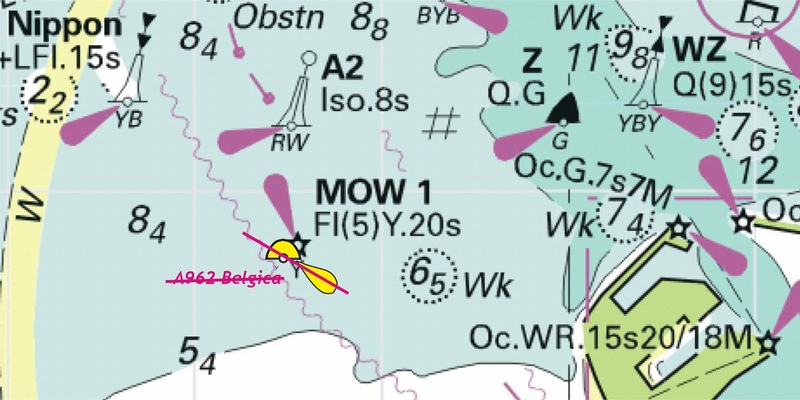 Three new yellow special marks (can buoys) adjacent to the deep water route to Zeebrugge. NETHERLANDS - Goeree - Rak van Scheelhoek - Buoyage. Iso.R.8s P 8 at 51° 50´·49N., 4° 02´·52E. P 10 light-buoy to, Iso.R.4s 51° 49´·97N., 4° 02´·31E. R1 at 51° 53´·19N., 4° 00´·98E. R3 at 51° 52´·73N., 4° 01´·47E. R5 at 51° 52´·31N., 04° 02´·02E. LFl.G.5s R7 at 51° 51´·90N., 4° 02´·59E. R9 at 51° 51´·40N., 4° 02´·94E. R10 at 51° 51´·40N., 4° 03´·40E. R11 at 51° 50´·85N., 04° 03´·32E. P8 R13 at 51° 50´·34N., 4° 02´·83E. UKHO Admiralty Charts: 110, 1872, 1873 and 1874. 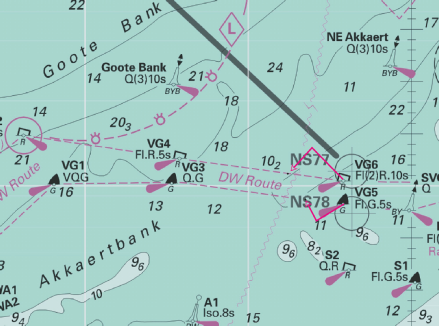 Substantial removal of marks in the Rak van Scheelhoek channel leading south to Stellendam. NETHERLANDS - Westerschelde - Cadzand-Bad - Restricted area. Buoyage. UKHO Admiralty Charts: 1872 and 1874. 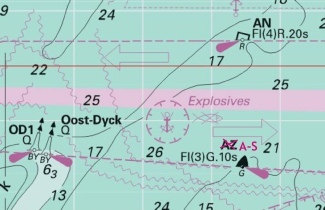 A new restricted area off the Dutch coast. BELGIUM - Westhinder S and SE - Buoyage. 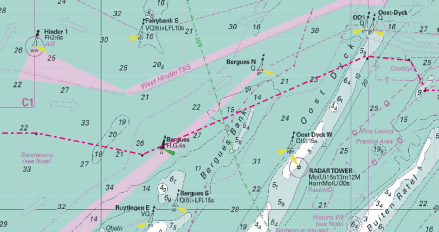 designation of buoy to, BerguesBk-N at 51°19´·92N., 2°24´·52E. 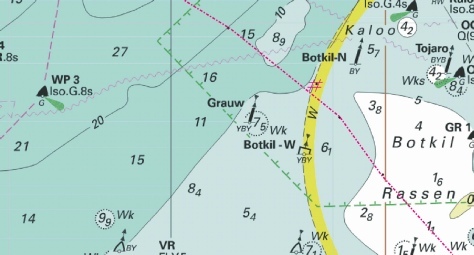 designation of buoy to, OostdyckBk at 51°21´·45N., 2°31´·10E. designation of buoy to, A-N at 51°23´·45N., 2°36´·90E. 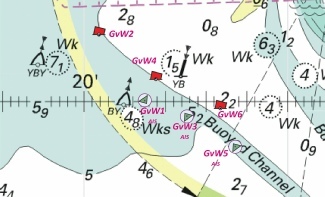 designation of buoy to, G-S at 51°24´·25N., 2°44´·65E. UKHO Admiralty Charts: 323, 1872, 1873, 1874 and 2449. Four simple and slight name changes around the Oost Dyck in Belgian waters. 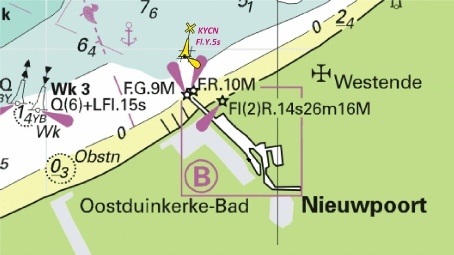 Depths of up to 1m less than charted exist between the pier heads in the entrance to Blankenberge (51°18´·90N., 3°06´·49E.) and south-eastwards into the port channel. Warning signs are located on the two pier heads. Contact MRCC Coastguards Oostende for the latest information. Mariners are advised to navigate with caution in the area. A temporary notice regarding a one metre reduction in depth between the pier heads at the entrance to Blankenberge. Mariners are advised to navigate with caution in the area. These and other changes will be included in the next New Edition of Charts 1872, 1873 and 1874. Images courtesy of Imray charts and Meridian ID10. An eclectic group of ten reductions in soundings off the Belgium coast. BELGIUM - Westhinder SE - Oostdyck Anchorage and Zeebrugge - Dredged area. Legend. Foul. Legend, 16,7m, centred on: 51° 20´·75N., 3° 11´·06E. at 51° 20´·4N., 2° 36´·1E. 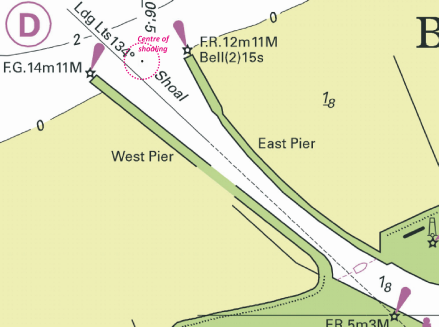 The first item (dredged area) is within a basin of the commercial harbour and therefore not illustrated. The removal of the Foul in the Oostdyck anchorage is a deletion of the notice No 462 in week 4 of this year. A new edition of Leisure Chart Folio SC5605. All sheets have been fully updated for New Editions and Notices to Mariners affecting source charts. FRANCE - North Coast - Approaches to Calais - Ridens de Calais N - Buoyage. Note: This update is included in New Edition 1892, published 26th February 2015. VQ RCW, from 51° 01´·23N., 1° 45´·36E. to: 51° 01´·00N., 1° 45´·84E. Q Ridens de Calais RCA, from: 51° 00´·90N., 1° 48´·71E. to: 51° 01´·00N., 1° 48´·53E. UKHO Admiralty Charts: 323, 1351 1610 and 2449. Imray Chart: C8 and C30. UKHO Leisure Folios: 5605.2 and 5605.10. Two small movements of buoys off Calais. BELGIUM - Oostende W - Stroombank S - Buoy. Insert Fl.Y.5s H8 at 51° 13´·31N., 2° 52´·17E. UKHO Admiralty Charts: 1873 and 1874. 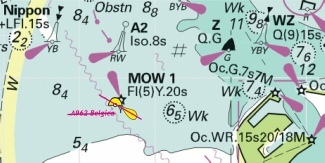 New yellow special mark close inshore to the west of Ostend. 5605.15 Ramsgate and Approaches - A Approaches to Ramsgate 1:12,500, B Ramsgate 1:5,000. NETHERLANDS - Vlissingen - Light. light to, Oc.WR.5s10m12-8M at 51°26´·30N., 3°34´·56E. 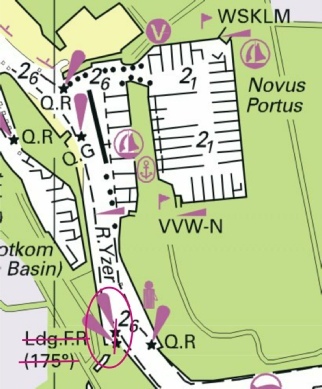 The Oc WRG light on the western mole at Vilssingen is change to Oc WR with a change in height/range and sectors. Note that the change in sector light is from 272° through 360° to 123.5° and not anti-clockwise. GvW1 at 51° 30´·01N., 3° 21´·50E. GvW3 at 51° 29´·85N., 3° 22´·63E. GvW5 at 51° 29´·30N., 3° 23´·73E. 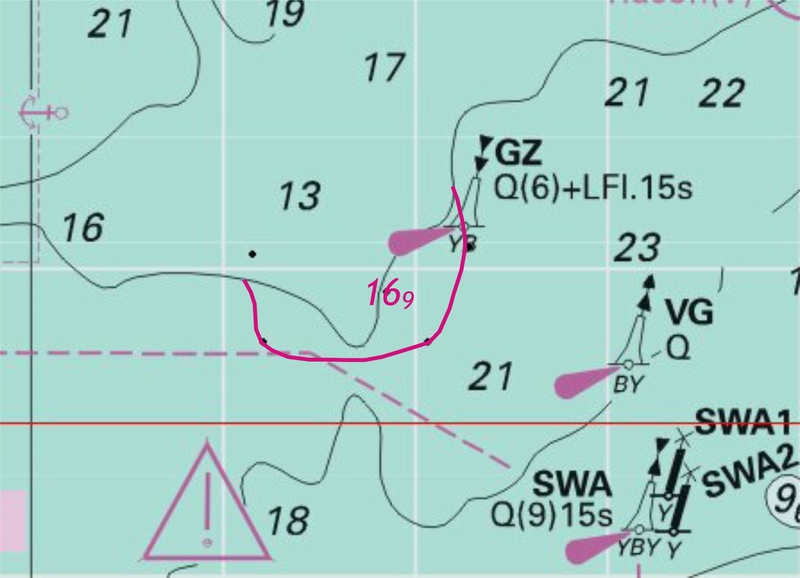 GvW2 from 51° 30´·83N., 3° 20´·20E. to 51° 31´·02N., 3° 20´·39E. GvW4 from 51° 30´·17N., 3° 22´·08E. to 51° 30´·35N., 3° 21´·77E. GvW6 from 51° 29´·36N., 3° 23´·80E. to 51° 29´·89N., 3° 23´·36E. UKHO Admiralty Charts: 1872, and 1874. 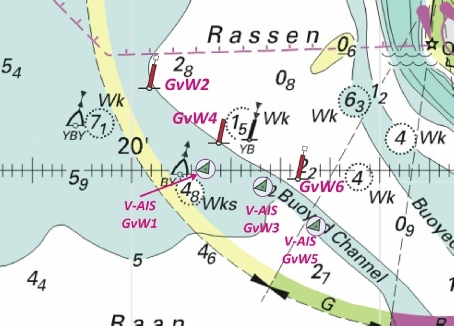 Some new Virtual AIS starboard hand ‘buoys in the Geul van de Walvischstaart leading south down to the entrance to the Westerschelde. Some small movements to the actual (real) port hand buoys! This image includes a representation of the UKHO IALA A region virtual lateral starboard buoy. BELGIUM - Westhinder E - Oostdyck Anchorage N - Foul. Insert at 51° 20´·4N., 2° 36´·1E. UKHO Admiralty Charts: 1872 and 1873. A foul near the Oost Dyck on the edge of the anchorage but in 16m of water so unlikely to trouble leisure craft. FRANCE - North Coast - Calais N - Ridens de Calais NE - Automatic Identification System. - Buoyage. Automatic Identification System, AIS, at RCE light-buoy (a) 51° 02´·45N., 1° 53´·23E. UKHO Admiralty Charts: 323, 1610, 1892 and 2449. 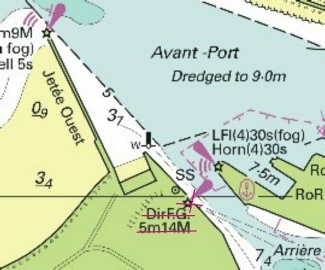 AIS now installed on RCE which marks the route into Dunkirk. This is now paired in AIS terms with Dyck which is nearby. BELGIUM - Zeebrugge - Lights. Four new fog lights in Zeebrugge. These are all well within the commercial harbour and therefore are not illustrated. The first two new lights are situated within the Britanniadok commercial basin and the last two on the Zeesluis Pierre Vandamme. BELGIUM - Zeebrugge - Lights. Radar station. Jetty. Buoyage. Dredged areas. 1. 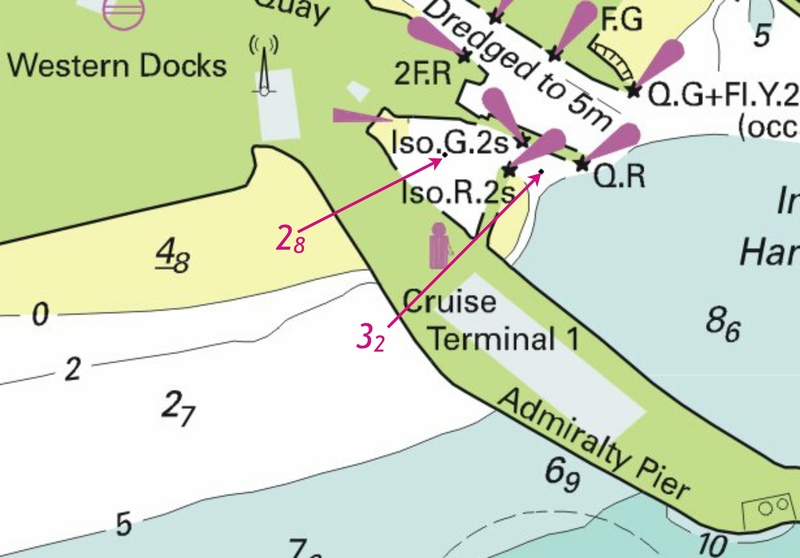 The accompanying block, showing a new light, radar station, jetty and amendments to buoyage and dredged areas, centred on: 51° 20´·6N., 3° 11´·8E. 2. F.R at 51° 21´·41N., 3° 11´·01E. The block published by the UKHO is for Zeebrugge and may be downloaded from the left hand column. There is an additional annotation for an extra light on the Wielingendok. BELGIUM - Nieuwpoort, Oostende and Blankenberge - Fog signals. fog signal, Bell(2)15s, and associated symbol, fog signal, at light 51° 18´·910N., 3° 06´·561E. fog signal, Bell(2)10s, and associated symbol, fog signal, at light 51° 09´·35N., 2° 43´·00E. Delete fog signal, Bell4s, and associated symbol, fog signal, at light 51° 14´·32N., 2° 55´·03E. UKHO Admiralty Charts: 1872, 1873, 1874 and 2449. Removal of the fog signal at each of the three Belgium ports. Each signal was on the end of one of the entrance moles. NETHERLANDS - Schouwen W - Banjaard - Buoyage. BZ 6 at 51° 42´·81N., 3° 35´·27E. BZ 10, from: 51° 42´·53N., 3° 36´·98E. to: 51° 41´·92N., 3° 36´·35E. BZ 6 at 51° 43´·18N., 3° 35´·72E. 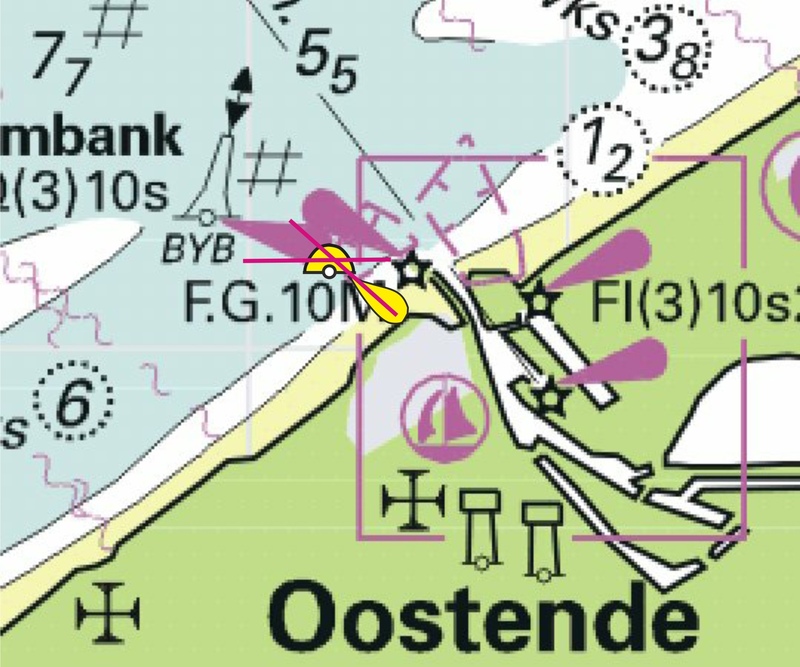 Three new unlit yellow special marks at the Banjaard off Schouwen. 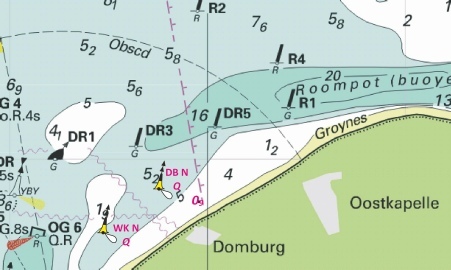 NETHERLANDS - Roompot SW - Domburg NW - Buoyage. Submarine pipeline. Two new temporary north cardinals in the Roompot. BELGIUM - Oosthinder N and Bligh Bank N - Depths. depth, 88 (a) at 51°37´·72N., 2°41´·53E. depth, 137 , with depth, 132 (b) at 51°37´·88N., 2°47´·64E. Two reductions in depth on the Belgium banks unlikely to trouble leisure craft. BELGIUM - Thornton Bank SE - Vlakte van de Raan - Obstruction. Obstn at 51° 26´·11N., 3° 03´·74E. Obstruction at over 7m north of the deep water route into Zeebrugge. NORTH SEA - Netherlands Sector - Walcheren W - Bligh Bank - Foul. Insert at 51° 39´·15N., 2° 45´·89E. UKHO Admiralty Charts: 1406, 1630 and 2449. A foul discovered close to the Bligh Bank wind farm in over 20m of water so unlikely to hinder leisure craft. ENGLAND - South East Coast - Dover Strait - Dover SE - The Varne NE - Buoyage. Q(3)10s Varne NE at 50° 59´·80N., 1° 22´·70E. UKHO Admiralty Charts: 323, 1610, 1892, 2449 and 2451. 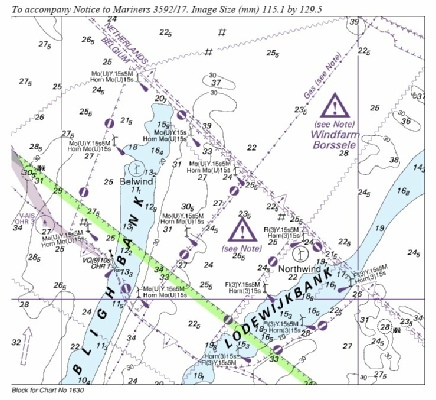 Confirmation of the Trinity House notice issued in week 37 of two new lighted buoys marking the Varne bank in the English Channel. GvW2 51° 30´·83N., 3° 20´·20E. to 51° 31´·02N., 3° 20´·39E. GvW4 51° 30´·17N., 3° 22´·08E. to 51° 30´·35N., 3° 21´·77E. GvW6 51° 29´·36N., 3° 23´·80E. to 51° 29´·89N., 3° 23´·36E. The three adjacent port hand buoys which actually exist have been moved slightly. NETHERLANDS - Buitenbanken W - Depths. UKHO Admiralty Charts: 110, 1406, 1408 and 1630. 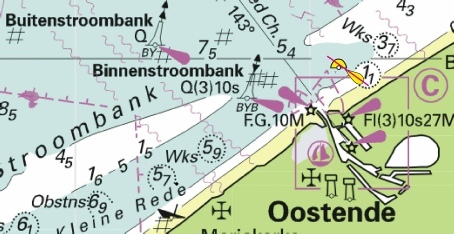 Reduction of depth on the West Buitenbanken (inshore western approach to the Hook of Holland). Unlikely to hinder leisure craft. SC5607 10th Edition Thames Estuary, Essex and Suffolk Coast. 5607.7 Rivers Stour and Orwell. 5607.10 Harbours on the East Coast. Notice to Mariners affecting source charts. FRANCE - North Coast - Approaches to Dunkerque - Buoyage. RCW from 51° 01´·23N., 1° 45´·35E. to 51° 01´·00N., 1° 45´·84E. RCA from 51° 00´·90N., 1° 48´·72E. to 51° 01´·00N., 1° 48´·53E. DKA from 51° 02´·55N., 1° 56´·96E. to 51° 02´·57N., 1° 57´·00E. DYCK from 51° 02´·98N., 1° 51´·76E. to 51° 02´·93N., 1° 51´·76E. RCE from 51° 02´·45N., 1° 53´·23E. to 51° 02´·32N., 1° 52´·95E. Yellow conical buoy from 51° 02´·32N., 1° 53´·34E. to 51° 02´·19N., 1° 53´·06E. Yellow conical buoy from 51° 02´·32N., 1° 52´·93E. to 51° 02´·20N., 1° 52´·67E. DW5 from 51° 02´·20N., 2° 00´·93E. to 51° 02´·23N., 2° 00´·82E. DW6 from 51° 02´·61N., 2° 01´·04E. to 51° 02´·83N., 2° 00´·74E. DW7 from 51° 02´·55N., 2° 02´·59E. to 51° 02´·41N., 2° 02´·39E. DW8 from 51° 02´·77N., 2° 02´·58E. to 51° 03´·00N., 2° 02´·21E. DW9 from 51° 02´·67N., 2° 04´·04E. to 51° 02´·60N., 2° 03´·96E. DW10 from 51° 03´·00N., 2° 04´·13E. to 51° 03´·19N., 2° 03´·78E. DW11 from 51° 02´·87N., 2° 05´·77E. to 51° 02´·79N., 2° 05´·53E. DW12 from 51° 03´·19N., 2° 05´·57E. to 51° 03´·38N., 2° 05´·36E. DW13 from 51° 03´·05N., 2° 07´·10E. to 51° 02´·98N., 2° 07´·10E. DW14 from 51° 03´·36N., 2° 07´·15E. to 51° 03´·56N., 2° 06´·93E. DW16 from 51° 03´·30N., 2° 08´·98E. to 51° 03´·52N., 2° 08´·62E. Mariners are advised to navigate with caution in the area. Charts will be updated when full details become available. UKHO Admiralty Charts: 323, 1350, 1351, 1873 and 1892. 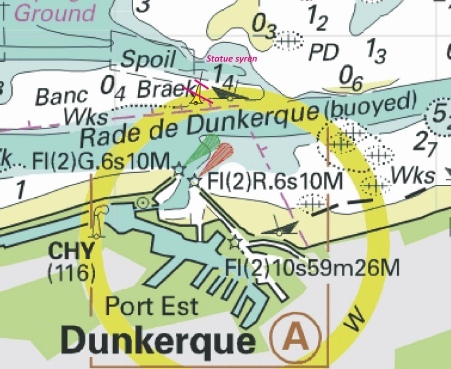 These are changes to buoy positions in the Chenal Intermediaire leading to the Port Quest of Dunkerque. It is not possible to produce an image of the changes. Generally the layout of the buoyage has not changed. Some moves are very small but the general trend is to move the starboard hand buoys west a little and the port hand buoys north thus increasing the width of the buoyed channel for large shipping. 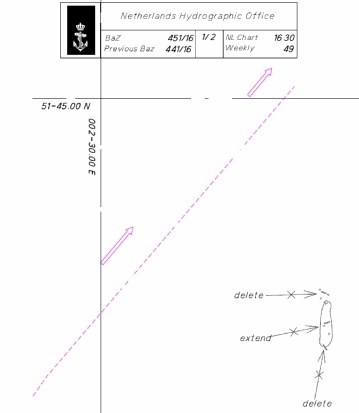 It is suggested that the PDF be printed to ensure that any relevant waypoints are updated. BELGIUM - Westhinder SW, Oostdyck S and Oostende N - Wreck. Marine farms. Wk at 51° 14´·78N., 2° 55´·38E. or at 51° 23´·34N., 2° 26´·48E. and 51° 16´·65N., 2° 27´·09E. UKHO Admiralty Charts: 323, 1872, 1873, 1874, and 2449. 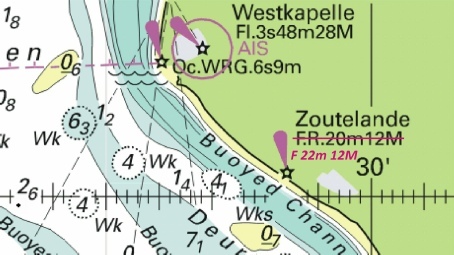 Insertion of a new wreck at just over 5m depth to the north-east of the entrance to Ostend and the deletion of two marine farms one, adjacent to the Westhinder light, the other adjacent to the Oost Dyke Radar Tower. 1. Varne N. E. Lighted Buoy, position 50° 59’.800N., 001° 22’.700E. Characteristics: Pillar: Black above yellow above black: Q(3)10 seconds: E. Cardinal topmark. 2. Varne N. W. Lighted Buoy, position 51° 00'.800N., 001° 22’.700E. Characteristics : Pillar: Black above yellow: Q: N. Cardinal topmark. Trinity House Notices to Mariners 27 of 2014. BELGIUM - Zeebrugge NW - Lodewijkbank - Restricted area. Wind farm. Wind turbines. Lights. UKHO Admiralty Charts: 110, 1406, 1630, 1872, 1873, 1874 and 2449. 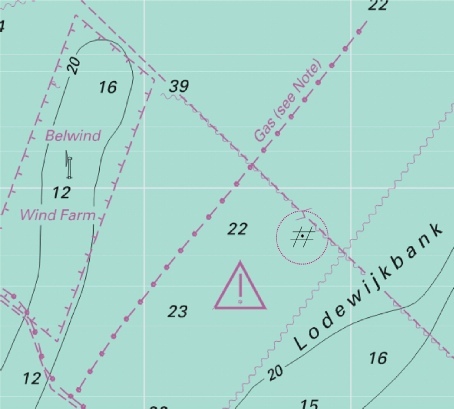 Formal notification of the restricted area that is the Lodewijkbank Wind farm. Note that in Belgium waters it is not permitted to transit through wind farms. FRANCE - North Coast - Calais NW - Out Ruytingen W - Buoy. - Automatic Identification System. 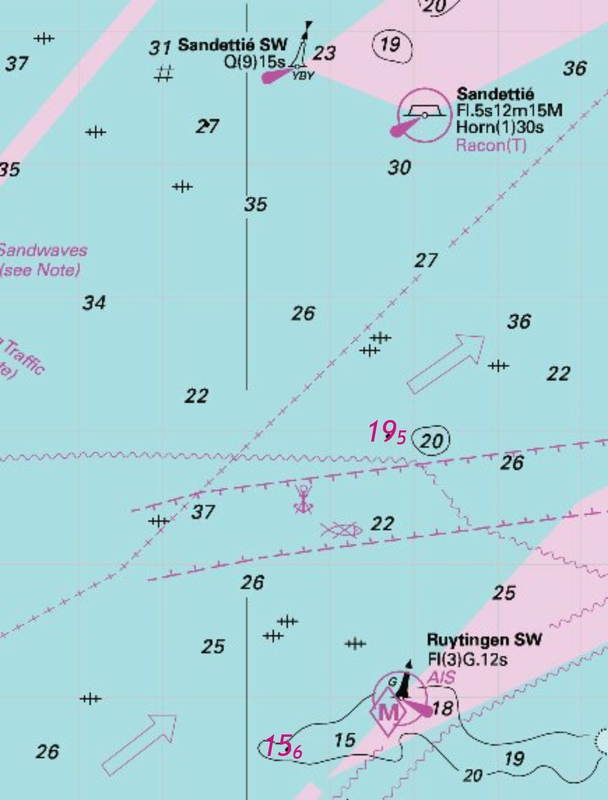 Move Fl(3)G.12s Ruytingen SW and associated Automatic Identification System, AIS, from: 51° 05´·01N., 1° 46´·74E. to: 51° 04´·33N., 1° 45´·84E. UKHO Admiralty Charts: 323, 1406, 1610, 1892 and 2449. UKHO Leisure Folios: 5605.2, 5606.1. A move of the Ruytingen Sw starboard hand buoy to the south-west. BELGIUM - Oostduinkerke-Bad NW - Buoy. 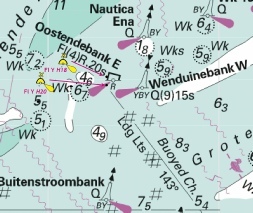 Amend designation of the north cardinal buoy Oostduinkerke to, Whitley 51° 09´·15N., 2° 39´·44E. UKHO Admiralty Charts: 1872, 1873 and 2449. Change of name to the north cardinal buoy north-west of Nieuwpoort. FRANCE - North Coast - Calais - Arrière-Port - Light. Removal of the light on the inner harbour entrance at Calais (which is mainly intended as a leading light from the lock from Basin Carnot). NETHERLANDS - Walcheren - Domburg NW - Depths. Insert depth, 19 , enclosed by 2m contour (a) 51° 34´·11N., 3° 27´·35E. UKHO Admiralty Charts: 110, 1630, 1872 and 1874. BELGIUM - Zeebrugge North-westwards - Lodewijkbank - Submarine power cables. UKHO Admiralty Charts: 1406, 1630, 1872 and 2449. This notice links with Notice 2354 of week 23 which inserted the southern part of the new power cable from the Wind Farm on the Lodewijkbank. Yellow line represents the power cable inserted by Notice 2354 (see the image under that week for continuation to the shore). Magenta line represents this weeks insertion. FRANCE - North Coast - Fairy Bank W and NW - Obstructions. Depths. Wrecks. depth, 137 at (a) 51° 27´·59N., 2° 14´·75E. depth, 146 at 51° 28´·27N., 2° 15´·75E. Obstn at 51° 25´·53N., 2° 10´·65E. Obstn at (b) 51° 26´·13N., 2° 11´·96E. Obstn at 51° 23´·45N., 2° 07´·16E. Obstn at 51° 29´·15N., 2° 16´·24E. Obstn at 51° 22´·49N., 2° 05´·27E. Replace Wk with Wk at 51° 26´·03N., 2° 12´·97E. UKHO Admiralty Charts: 323, 1406, 1610, 1630, 1872, 1873, 2182 and 2449. 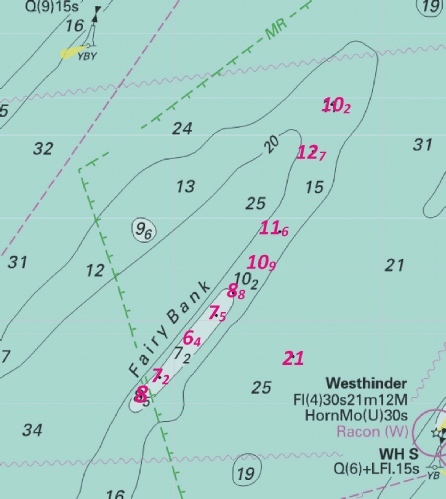 A whole range of obstructions and revised depths on the Fairy Bank but all are at a depth that will not hinder leisure craft. ENGLAND - South East Coast - Goodwin Sands SW - Foul. Insert PA at 51°12´·37N., 1°27´·75E. UKHO Admiralty Charts: 323 and 1828. A new FOUL position approximate in The Downs in water sufficiently deep that it will not trouble leisure craft. NORTH SEA - Netherlands Sector - Zeebrugge to Lodewijkbank - Submarine power cable. Image courtesy of Imray Charts and Meridien ID10. Left click to enlarge; right click to download. UKHO Admiralty Charts: 110, 1406, 1630, 1872, 1874 and 2449. A new power cable through the Belgium wind farms to Zeebrugge. Closely follows some existing power cables. Notice 2188 - BELGIUM - Fairy Bank N and Goote Bank SW - Depths. 20m contour, joining: (a) 51° 24´·09N., 2° 42´·31E. depth, 163 , with depth, 159 at 51° 29´·42N., 2° 17´·65E. depth, 114 , with depth, 107 at 51° 26´·23N., 2° 18´·65E. 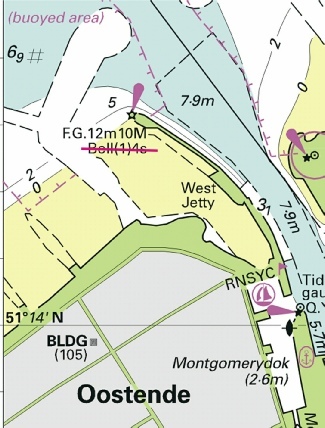 Extension of the 20m contour at the Goote Bank near the GZ south cardinal buoy. Indicated sounding is from the NtM 2121 from last week. 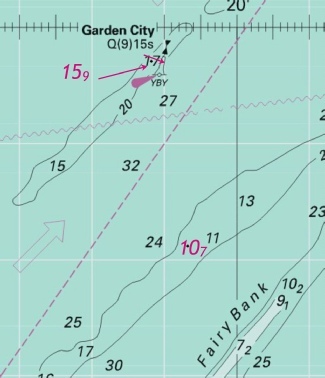 Slight reduction of depths on the Fairy Bank near the Garden City West Cardinal Buoy and further to the west. Images courtesy of Imray Charts and Meridien ID10. Left click to enlarge; right click to download. Notice 2121 - BELGIUM - Noordhinder, Westhinder E and Gootebank SW and N - Depths. depth, 81 at (a) 51°35´·80N., 2°34´·25E. depth, 184 , and extend 20m contour S to enclose 51°23´·85N., 2°43´·70E. depth, 81 at (a) 51°35´·81N., 2°34´·23E. depth, 169 at (b) 51°26´·73N., 2°34´·52E. 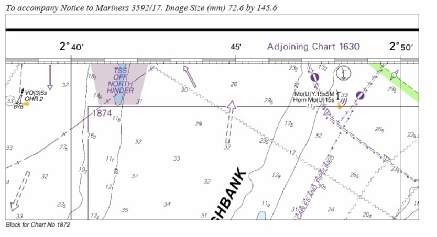 depth, 184 , and extend 20m contour SE to enclose 51°23´·85N., 2°43´·70E. depth, 85 at (a) 51°37´·15N., 2°34´·29E. depth, 81 at (b) 51°35´·81N., 2°34´·23E. depth, 169 at (c) 51°26´·73N., 2°34´·52E. depth, 16 at 51°29´·30N., 2°46´·15E. depth, 169 at (a) 51°26´·73N., 2°34´·52E. depth, 184, and extend 20m contour SE to enclose 51°23´·85N., 2°43´·70E. depth, 16 at (a) 51°29´·30N., 2°46´·15E. depth, 169 (b) 51°26´·73N., 2°34´·52E. Replace depth, 97 , with depth, 85 at 51°37´·15N., 2°34´·32E. An eclectic mix of a reduction of 5 new depths in various positions over the Belgium banks. None should particularly trouble leisure craft. 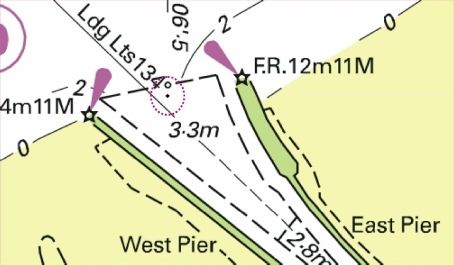 Includes changes to depths from the latest Dover Harbour Board surveys. Notice 1919 - BELGIUM - Blankenberge N - Buoy. Delete A962 Belgica at 51° 21´·53N., 3° 06´·96E. Removal of a yellow special buoy off Zeebrugge. 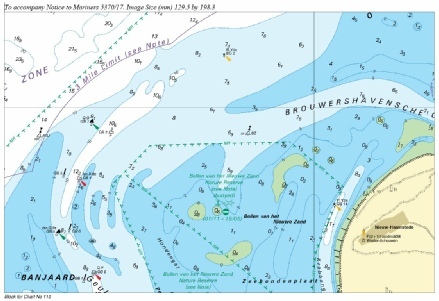 Chart 128 - International Chart Series, Netherlands and Belgium, Westerschelde, Baalhoek to Wintam. Note: This chart remains affected by Notice 5162(T)/13. Includes changes to depths from the latest Netherlands Government and Belgian Government surveys and changes to coastline. Notice 1833 - BELGIUM - Nieuwpoort - Lights. Leading line. F.R at (a) 51° 08´·15N., 2° 44´·66E. leading line, pecked and firm line, and associated legend, 175°, extending in direction 355° from (a) above. Removal of the two leading lights leading up the River Yzer beyond the marinas. Notice 1736 - BELGIUM - At West Hinder TSS - Kwintebank N - Buoyage. UKHO Admiralty Charts: 1406, 1872, 1873 and 2449. UKHO Leisure Folios: 5605.1, 5606.1. 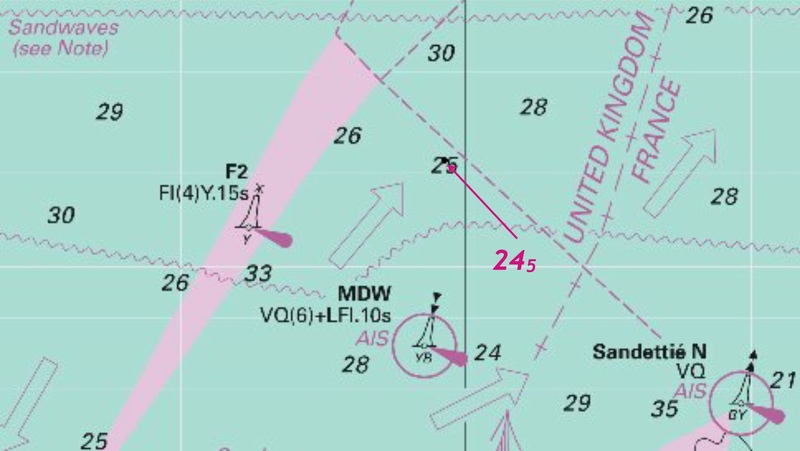 The buoy is in the correct position on Imray’s chart C30, the only difference being the designation is A-S and not AN as shown. What has happened is that it was moved vide Notice 882 back in week 9 but is now moved back to its original position but with the designation A-S (notified in week 9) remaining. So those people who did nothing got it right! Notice 1706 - BELGIUM - Oostende - Buoy. Delete at 51° 14´·29N., 2° 54´·51E. Removal of a yellow wave recorder buoy on the western side of the entrance to Ostend. Notice 1467(T)/2014 BELGIUM - Zeebrugge W - Wenduine NW and Blankenberge N - Works. Submarine pipelines. Buoyage. 1. Works are in progress in the vicinity of Wenduine and Blankenberge. 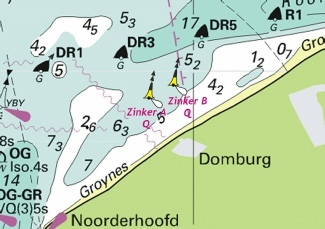 Zinker at 51° 18´·62N., 3° 04´·31E. DC1 Q at 51° 19´·44N., 3° 06´·80E. (All positions are referred to WGS84 Datum). 4. Mariners are requested not to fish or anchor in the vicinity of the pipelines and to navigate with caution in the area. 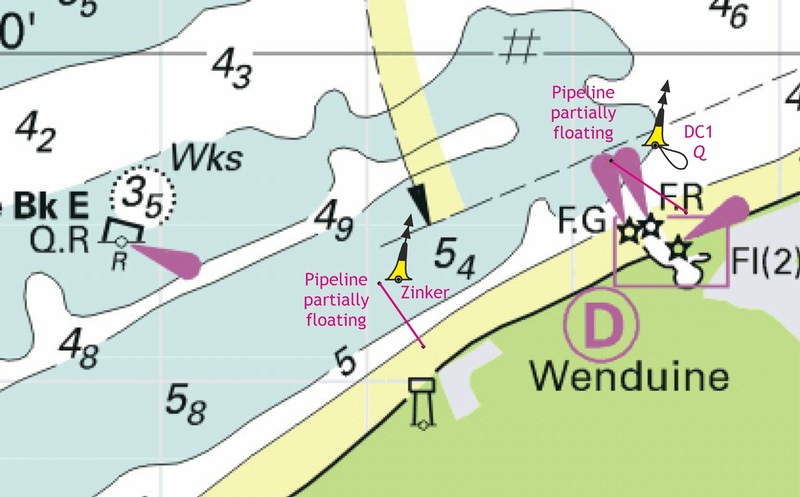 Partially floating pipelines installed near Wenduine (west of Zeebrugge) and marked with one unlit and one lit North Cardinal Buoys. Replace depth, 23, with depth, 27 at 51°09´·29N., 1°44´·55E. Insert depth, 275 at (a) 50°47´·07N., 1°01´·13E. Insert depth, 26 at (a) 51°09´·42N., 1°44´·92E. Delete depth, 25 at 50°47´·00N., 1°01´·12E. UKHO Admiralty Charts: 323, 536, 1406, 1892, 2449 and 2451. This is a partial amendment of Notice 879 in Week 9 revising the depth upwards. These depths however mean that these will not trouble leisure craft. Notice 1086 - FRANCE - North Coast - Calais N - Depths. depth, 205, with depth, 195, enclosed by 20m contour at 51°06´·96N., 1°46´·70E. depth, 161, with depth, 156 at 51°04´·60N., 1°45´·51E. depth, 195, and extend 20m contour W to enclose (a) 51°06´·96N., 1°46´·70E. depth, 156 at (b) 51°04´·60N., 1°45´·51E. Insert depth, 195, and extend 20m contour W to enclose (a) 51°06´·96N., 1°46´·70E. Replace depth, 16, with depth, 156 at (b) 51°04´·60N., 1°45´·51E. This longish correction amounts to two new depths in the NE heading TSS, between the Sandettie and Ruytingen. These will not trouble leisure craft. Notice 879 - ENGLAND - South East Coast - Dover Strait - Bullock Bank NW, The Varne E, Sandettié Bank SW and N - Depths. depth, 206 , with depth, 196 , enclosed by 20m contour at 50° 59´·02N., 1° 24´·84E. depth, 27, with depth, 23 at 51° 09´·29N., 1° 44´·53E. depth, 255 , with depth, 245 at 51° 21´·16N., 1° 59´·64E. Insert depth, 25 at (a) 50° 47´·05N., 1° 01´·04E. Insert depth, 23 at (a) 51° 09´·29N., 1° 44´·53E. depth, 206, with depth, 196 , enclosed by 20m contour at 50° 59´·02N., 1° 24´·84E. depth, 206 , with depth, 196, enclosed by 20m contour at 50° 59´·02N., 1° 24´·84E. Insert depth, 25 at 50° 47´·05N., 1° 01´·04E. Replace depth, 206 , with depth, 196, enclosed by 20m contour at 50° 59´·02N., 1° 24´·84E. 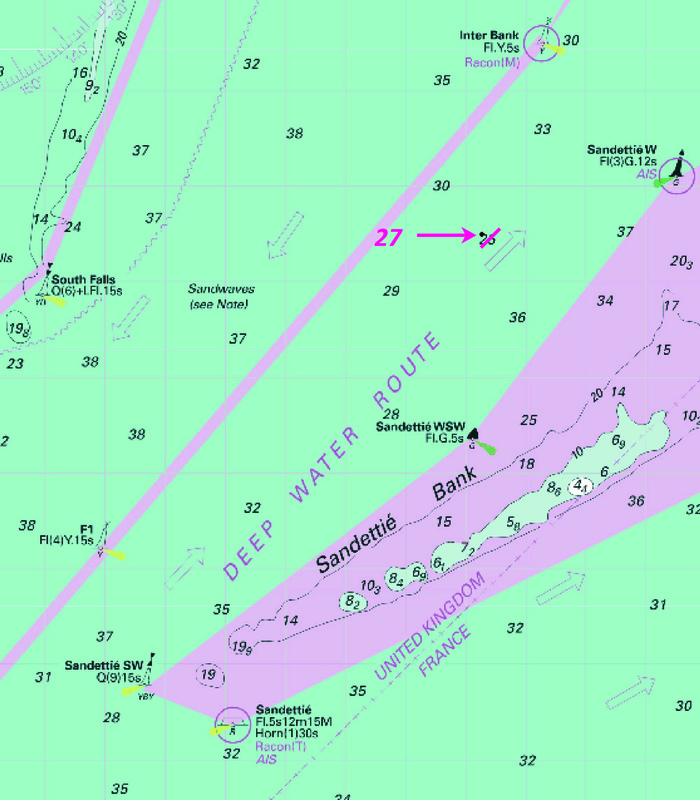 A series of revised depths at eclectic positions in the Eastern channel and near the Sandettie. None of these revised depths should trouble leisure craft. Notice 882 - BELGIUM - Oostende and Kwintebank N - Restricted area. Buoyage. Insert Fl(3)G.10s A-S at 51° 20´·81N., 2° 40´·29E. Delete Fl(3)G.10s AZ at 51° 21´·15N., 2° 36´·92E. symbol, entry prohibited, centred on: 51° 14´·47N., 2° 55´·34E. UKHO Leisure Folios: 5605.12, 5606.1. Works to the east of the Ostend entrance have been completed and the prohibition zone removed. 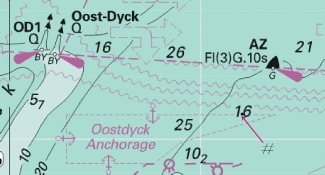 The port hand buoy (AZ) marking the end of the TSS Oost-Dyck has been replaced (A-S)/moved slightly south. Notice 201 - ENGLAND - South Coast - Dover - Western Docks SE - Depths. depth, 32 (a) at 51° 06´·879N., 1° 18´·948E. depth, 28 (b)at 51° 06´·888N., 1° 18´·867E. These two new depths are in the basin to the west of the dredged channel leading to the marina and in consequence would be unlikely to trouble leisure craft. Notice 4668 - NORTH SEA - Netherlands Sector - North Hinder Junction - Wreck. Buoy. at (a) 51° 52´·90N., 2° 36´·15E. Notice 4640(T)/13 - FRANCE - North Coast - Approaches to Dunkerque - Passe de L.Est - Depths. E2 51° 04´·3N., 2° 22´·3E. E4 51° 04´·5N., 2° 24´·5E. 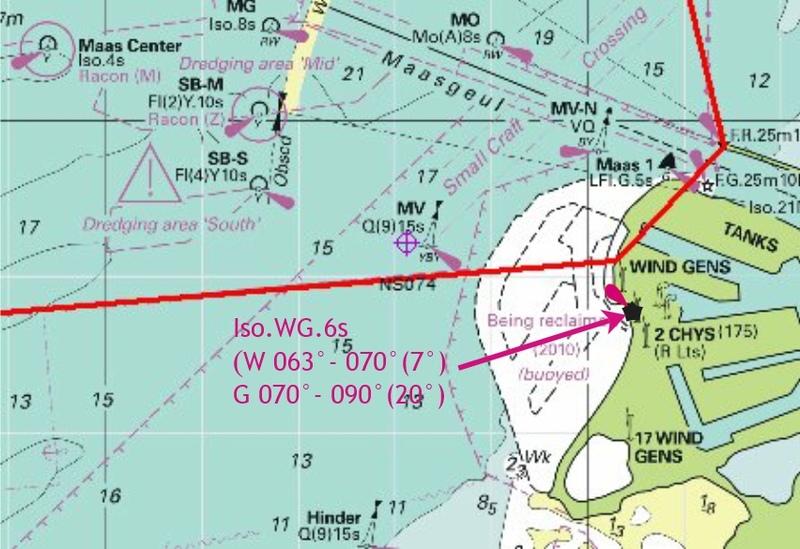 This reduction in depth warning relates to the Rad de Dunkerque channel leading east to the Passe de Zuydcoote about 2nm east of Dunkerque Eastern entrance. The notice gives no details of the depth to be expected. Notice 4523 - BELGIUM - Oostende - Restricted area. 3. symbol, entry prohibited, centred on: 51° 14´·37N., 2° 54´·77E. 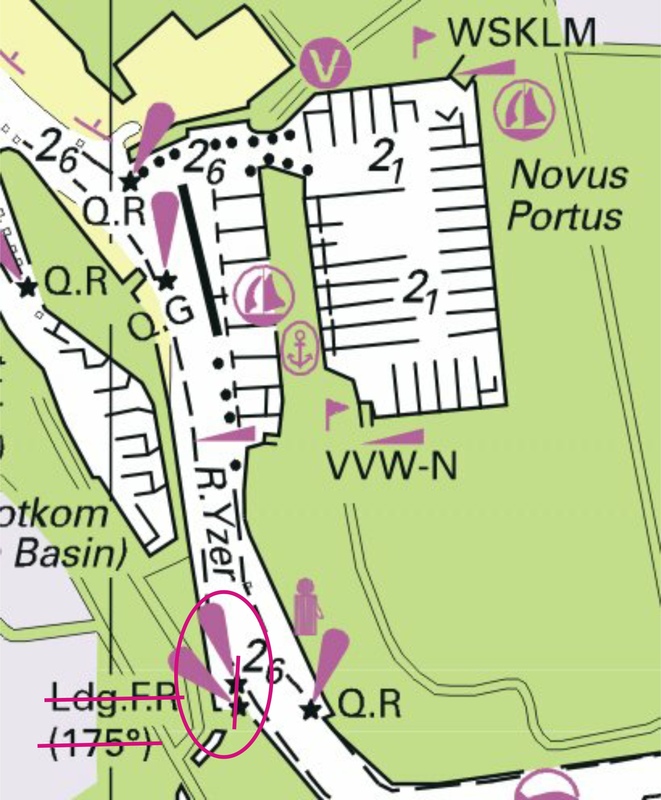 This area (as marked in solid magenta line) on the western side of the Ostend entrance is no longer restricted. Notice 4293 - BELGIUM - Zeebrugge North-westwards - Thornton Bank - Buoyage. Wind turbines. Fog signals. - Legend. CPN at 51° 33´·97N., 2° 54´·70E. 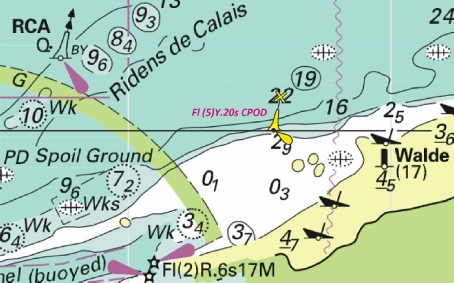 Fl.Y.5s CP2 at 51° 33´·29N., 2° 56´·21E. (3)10s CPE at 51° 32´·00N., 2° 58´·88E. CPN at 51° 34´·00N., 2° 54´·71E. 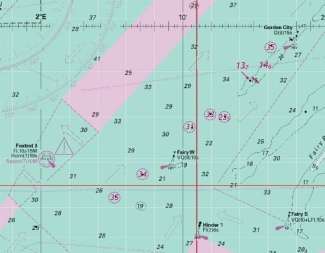 Fl.Y.5s CP2 at 51° 33´·30N., 2° 56´·21E. (3)10s CPE at 51° 32´·02N., 2° 58´·91E. Fl(5)Y.20s (Wave Recorder) at 51° 33´·65N., 2° 59´·10E. (a) 51° 32´·81N., 2° 53´·10E. (b) 51° 34´·86N., 3° 00´·20E. (c) 51° 33´·84N., 3° 00´·96E. (d) 51° 31´·26N., 2° 55´·68E. symbol, wind farm at (e) 51° 32´·50N., 2° 55´·90E. CPN at 51° 33´·97N., 2° 54´·68E. (3)10s CPE at 51° 32´·02N., 2° 58´·91E. Further changes at the Thornton Bank Wind Farm as it progresses. Note that Belgium rules do not permit passage through completed wind farms. Image copyright of CTTE. Left click to enlarge, right click to download. Notice 4200 NETHERLANDS - Maasvlakte - Prinses Margriethaven - Light. 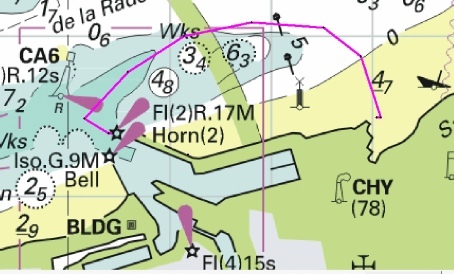 Iso.WG.6s at (a) 51°57´·62N., 4°00´·85E. This new light may well be worth noting for those who head up to the Hook of Holland (Europort) along the coast. Notice 4044 - FRANCE - North Coast - Dunkerque Port Ouest – Avant-port Ouest - Maritime limit. Works. (b) 51° 02´·14N., 2° 10´·70E. (c) 51° 01´·87N., 2° 10´·62E. An area of works to avoid within the Dunkirk West harbour from which of course yachts are discouraged. 3894 BELGIUM - Westerschelde North-westwards - Thornton Bank - Buoyage. Note: This update will be included in New Editions of Charts 1872 and 1874 to be published 19 September 2013.